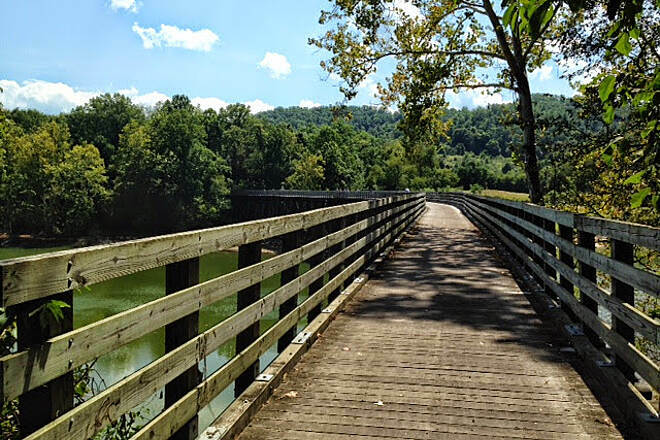 The Virginia Creeper National Recreation Trail offers scenic wonders from dense forests, open fields and lush waterways to railroad relics and delightful small towns. 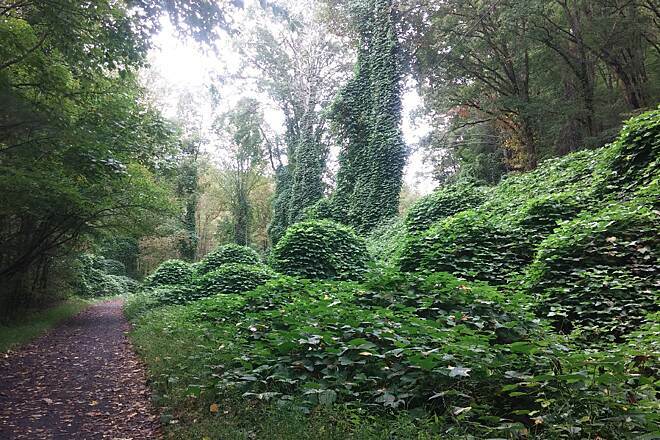 Cyclists and equestrians love the length of the Creeper, and many local walkers and joggers take advantage of the pleasant opportunity for a little exercise. 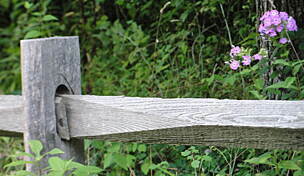 There are so many trestles along the route that each is numbered with an identifying plaque at either end of the bridge. 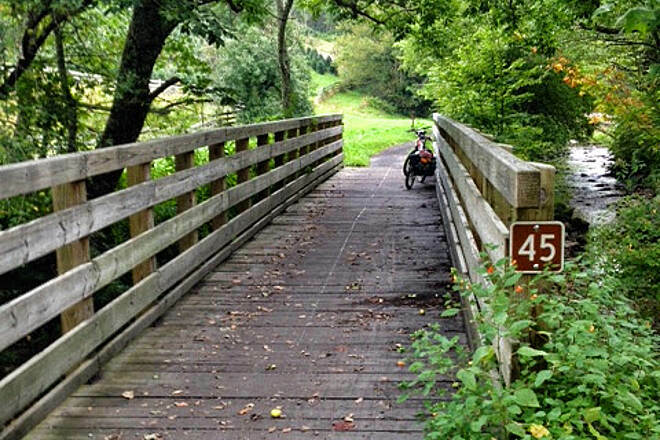 Originally, there were more than 100 along the railroad over the region's web of picturesque creeks and rivers; 47 trestles remain on the rail-trail today. Some are quite short, less than 100 feet long, but the longest are more than 600 feet. 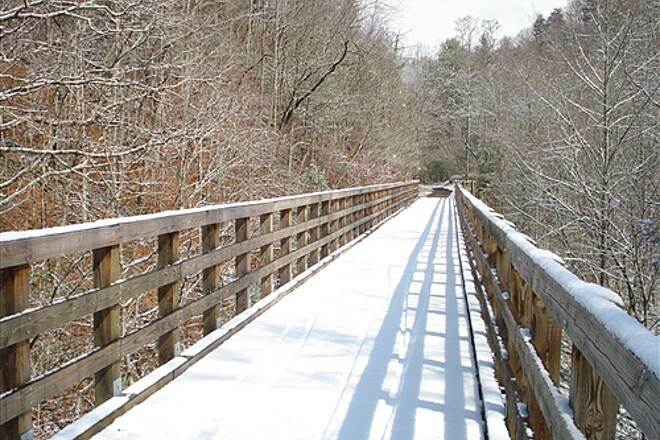 At nearly 3,600 feet, Whitetop Station, the trail's eastern terminus, is its high point. Westward from there to the trail's midpoint at Damascus, is an easy downhill ride. 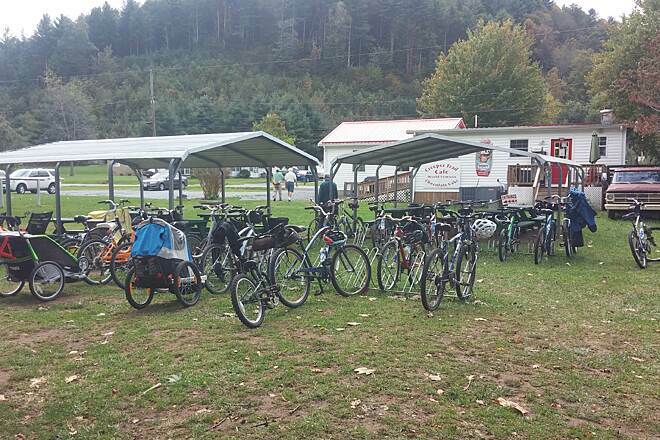 Riding in the reverse direction would be a challenging uphill climb for inexperienced riders, so many visitors park in Damascus, take one of the numerous shuttle services up to Whitetop Station, and then ride down to their cars. 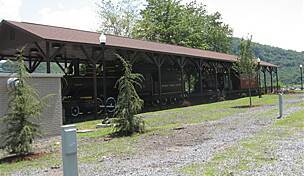 The first 17-mile stretch to Damascus allows for numerous restroom breaks at its many trailheads, some of which are housed in restored railroad depots. 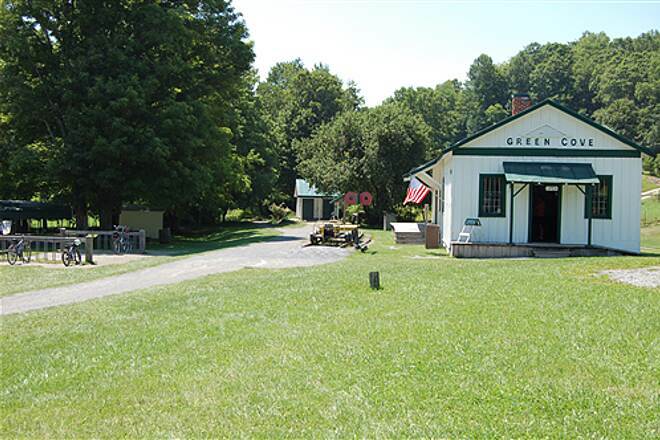 Green Cove Station in particular is a standout; it's the oldest station on the trail and was once the center of the community. 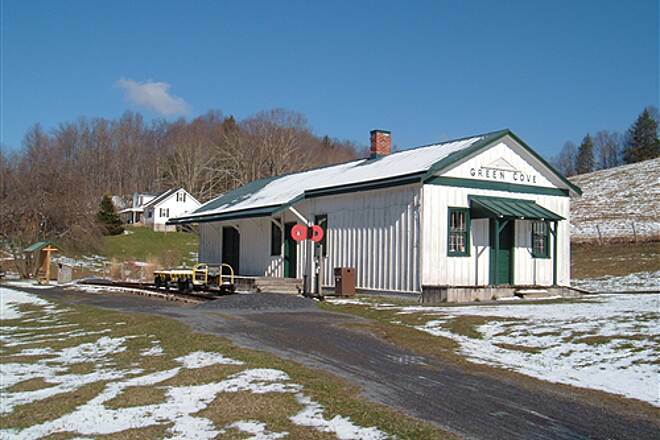 Green Cove Station was a post office, general store, and cargo location. Today, it serves as a museum with artifacts on display—like the original mail boxes—and it frequently features photography exhibits or live music from local groups. 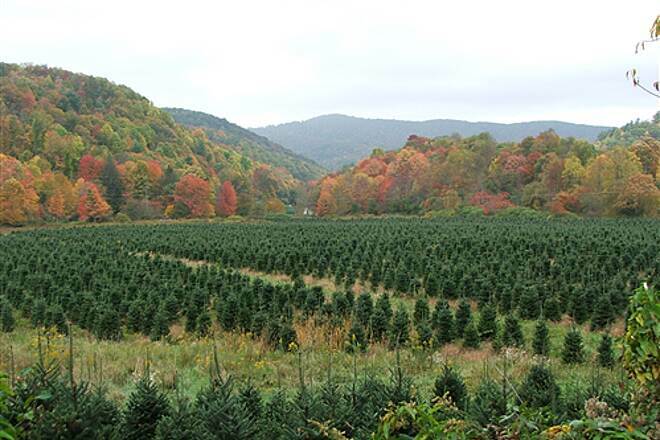 This section also travels through terrific scenery, from Christmas tree farms and grazing llamas to river views and deep forestland. 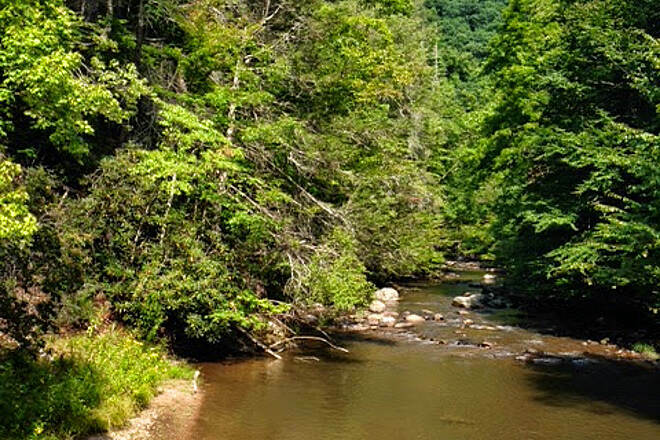 The Appalachian Trail weaves on and off the Creeper as well. 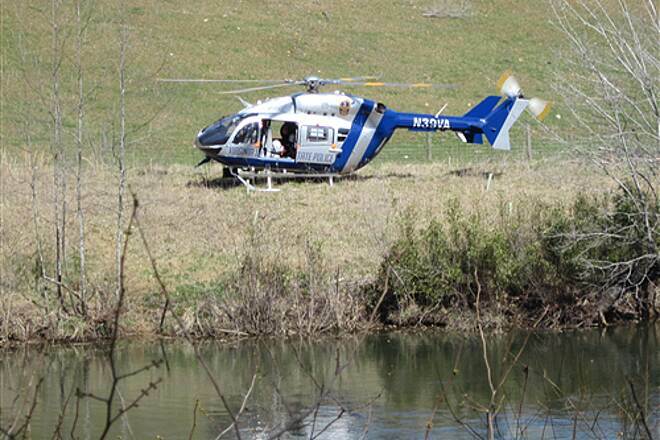 After going through dense trees, you will emerge to glide over bridges high above Laurel and Green Cove creeks. 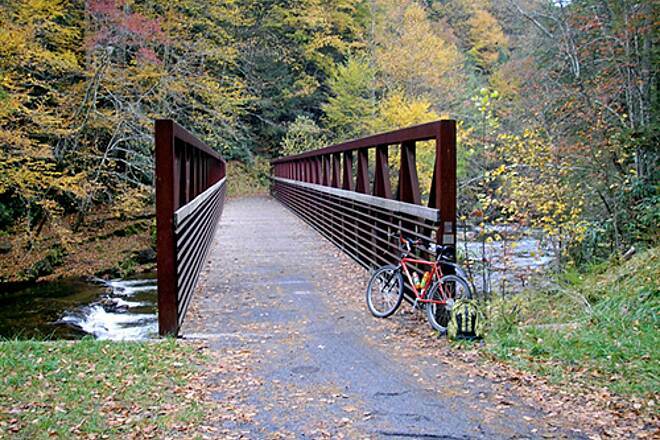 Around the midpoint of the Virginia Creeper Trail, you'll reach the Damascus trailhead. 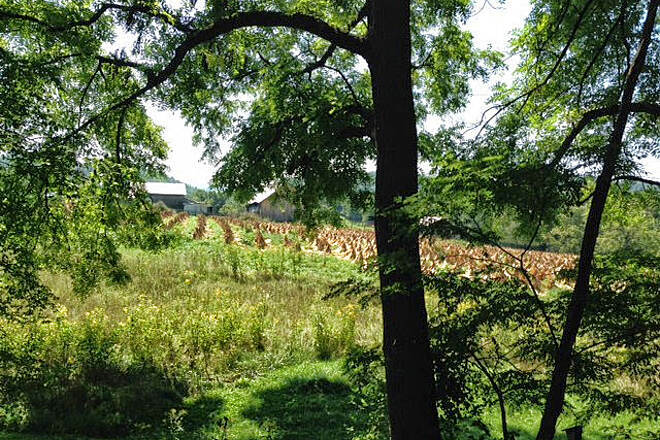 Before tackling the rest of the trail, consider taking a break in this sweet town. 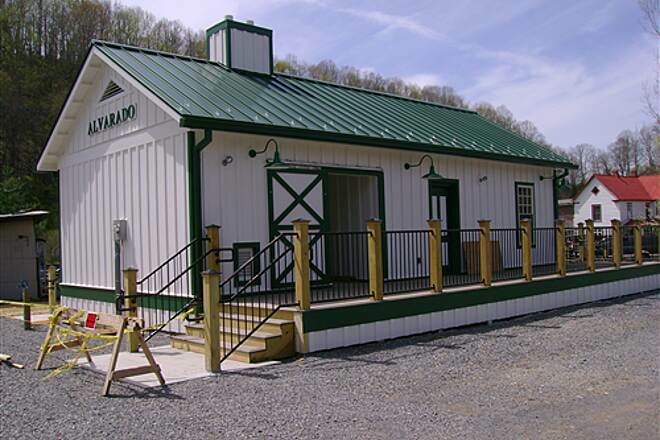 Damascus is the self-proclaimed friendliest town on the trail, and it won't take you long to see why: here you'll find restrooms, a caboose housing an information booth, a replica train engine and parking. 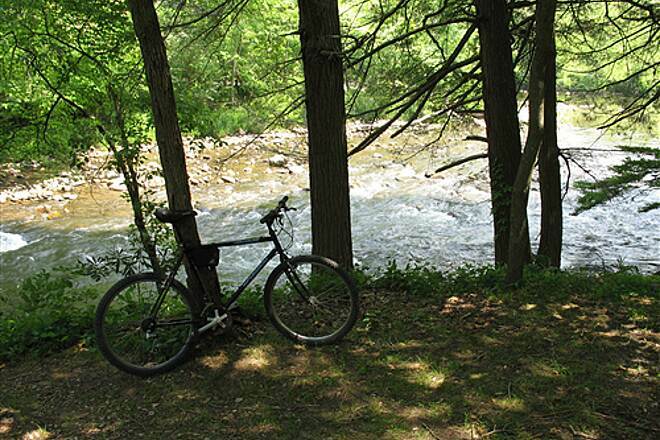 Veer off the trail to find lunch stops and bike shops in town. After your break, get ready for a little work; from Damascus to trail's end in Abingdon, a little more effort is required. The constant downhill is exchanged for a flat grade with some gentle rises and descents. It's not strenuous but it is a change from the first section. 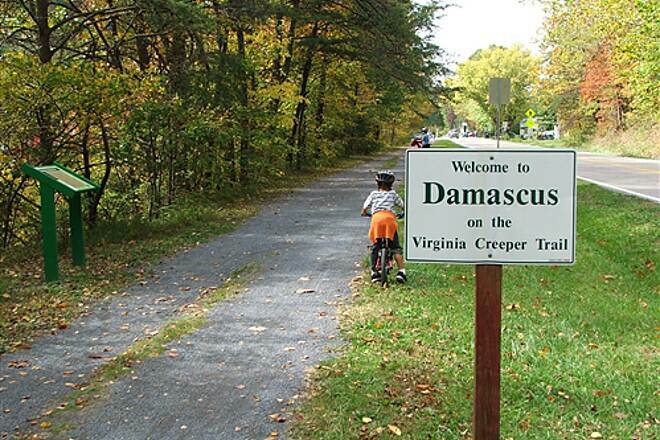 If you are bicycling, be aware that abundant equestrian use just after Damascus can leave its mark on the trail surface and give you a bumpy ride. But don't let a few bumps get you down. 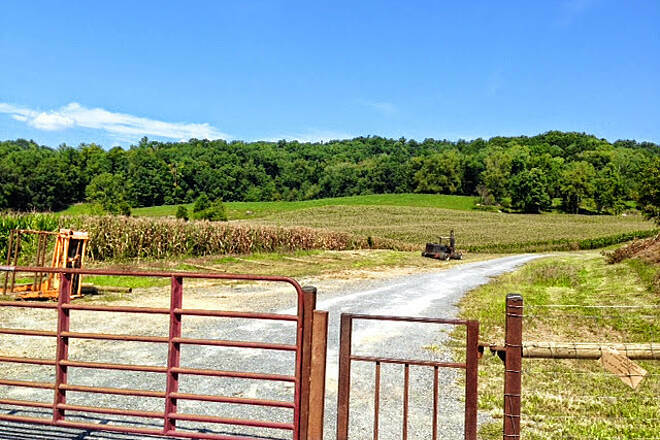 They start to peter out about 7 miles before Abingdon, and some of the Creeper's most beautiful river and farmland views are still ahead. 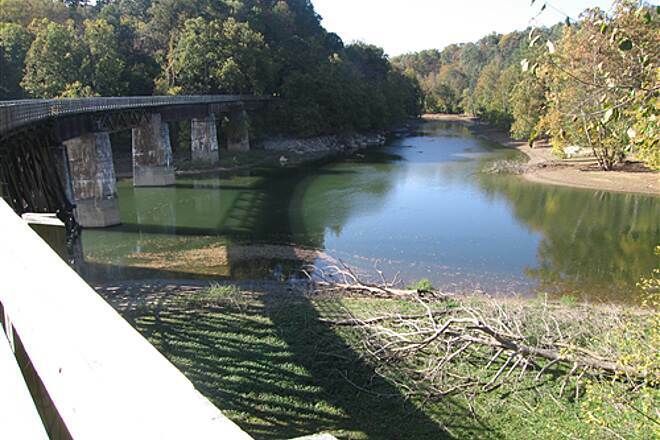 On a ridgeline high above the South Fork of the Holston River, you will emerge onto a bridge offering invigorating views of South Holston Lake below. 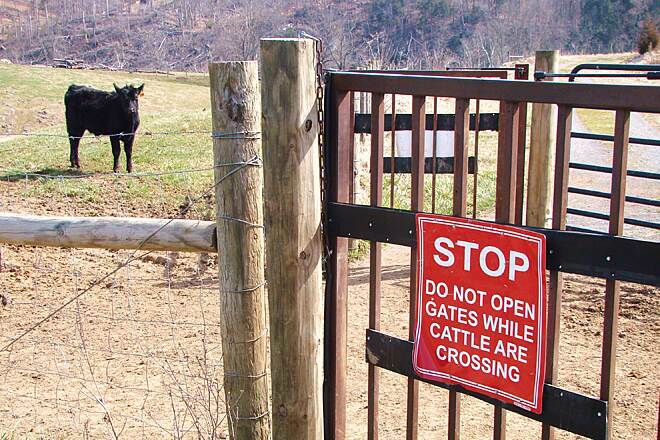 As you continue your journey toward Abingdon you will run into cattle gates across the trail. 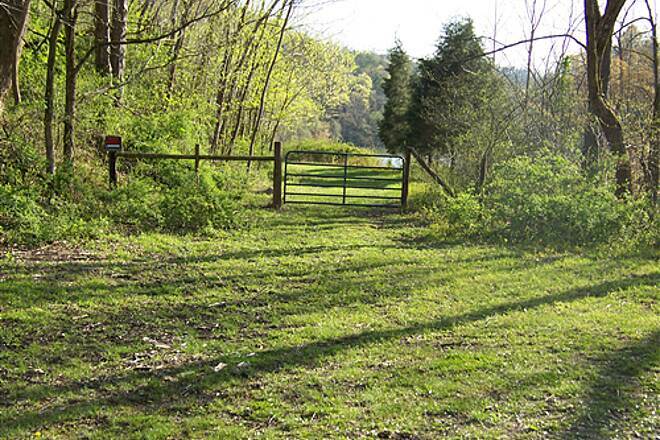 These gates mark your entrance to the Creeper's expansive grazing meadows. 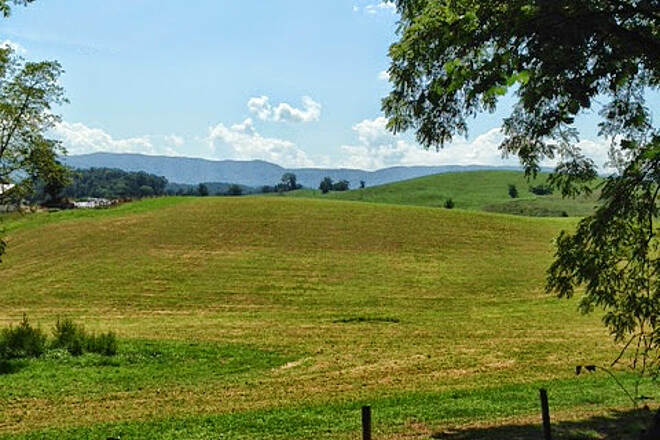 This tranquil farmland accompanies you for much of the remainder of the journey. 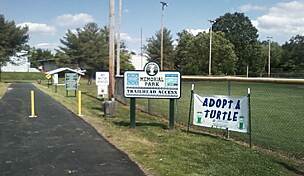 About a half mile from Abingdon is a public park with restrooms, picnic areas and a water fountain. Just across the last bridge, you will reach the endpoint. 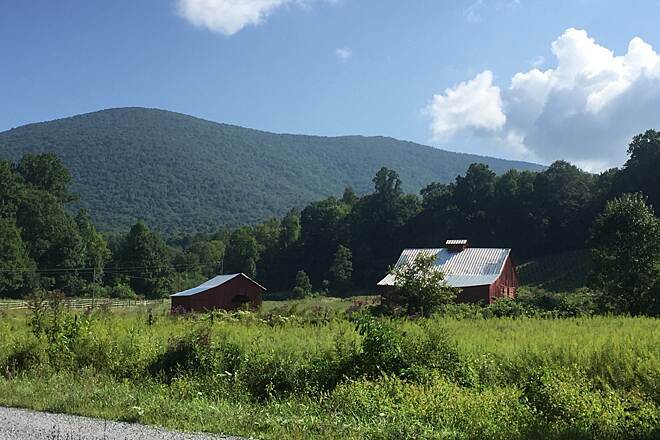 If you are traveling to the Virginia Creeper from out of town, consider that many bike shops in Damascus and Abingdon offer bike rentals and a shuttle to the Whitetop Station trailhead. 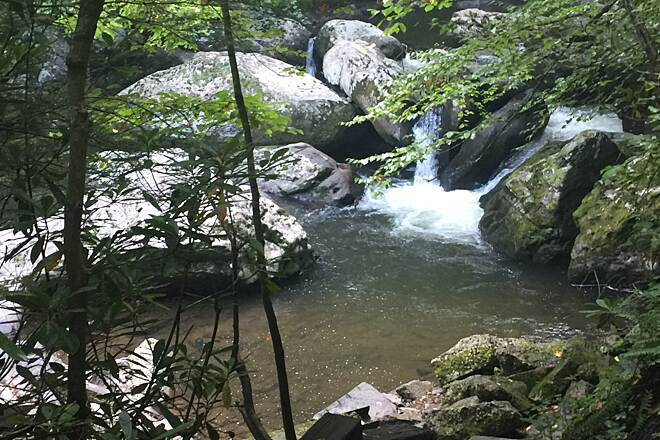 Also, for those who would like to camp during their trail trip, there are several campgrounds nearby, including those operated by the Forest Service in the Mount Rogers National Recreation Area. 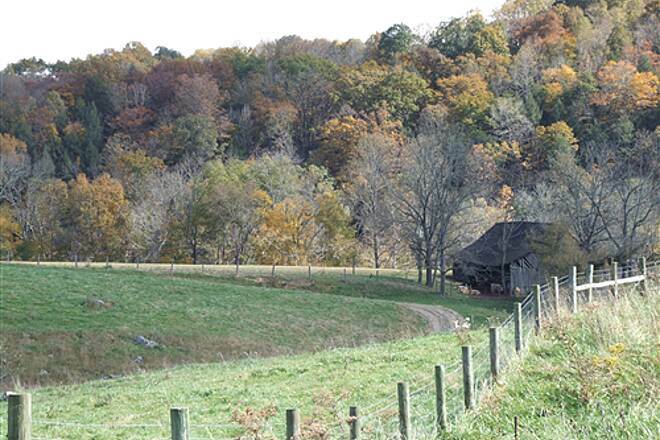 To get to the Whitetop Station trailhead, follow US 58 east from Abingdon into Grayson County. Turn right on State Route 726 and head south toward the North Carolina border. You will see the parking area off of 726. 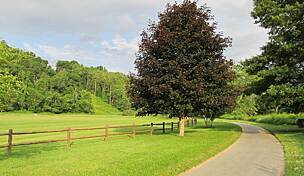 To get to the Abingdon trailhead, head south on Main Street/US 11 in Abingdon and turn left onto Pecan Street. 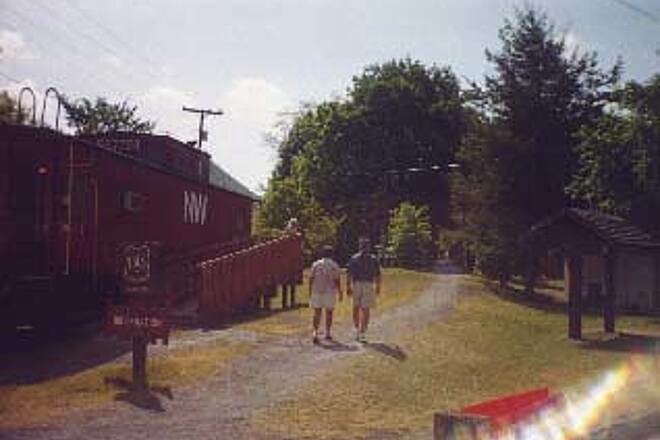 There is a large locomotive engine on display by the trailhead, which you can see to the left of the parking lot. Thia was an exhilarating ride. took shuttle provided by mom & pop company in damascus to top of mountain. 17 mile downhill ride. a little rough in spots but all in all a great ride. small restaurant once back in damascus for a quick bite. As a 60 year old man, I've wanted to do the VCT for quite some time. 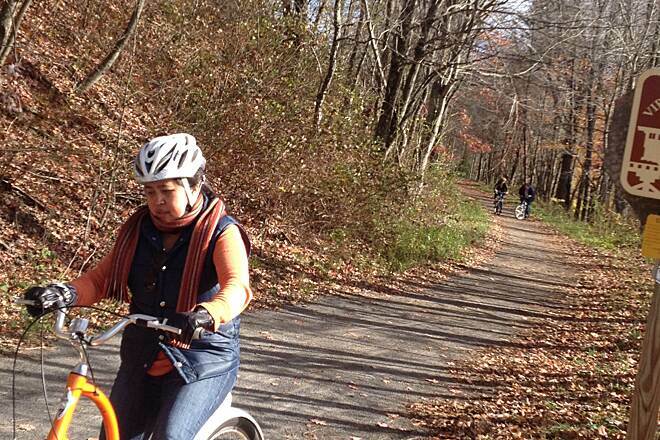 Last year, I got an e-bike to ride some of the hills in the Appalachian Mountains. It has made riding so enjoyable for a guy my age and since then, I ride so much more often. I have to say, it made riding up the hill from Damascus to White Top a pure pleasure and the ride back down...well that's what everyone seems to love doing. 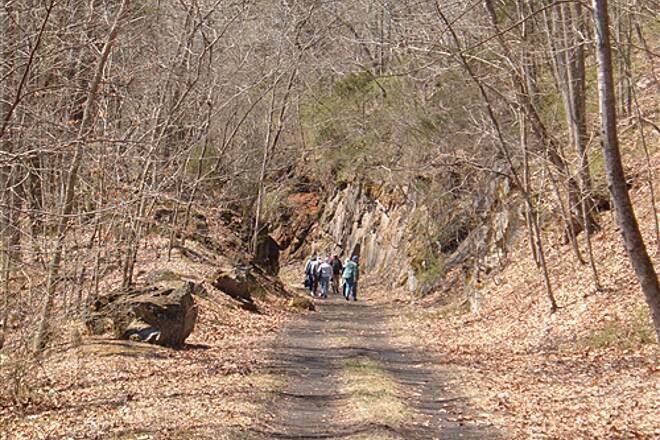 The scenery along this jewel of a trail is awesome. Don't forget to take a good camera. I'm planning to do the Abingdon, Virginia half soon. Can't wait! 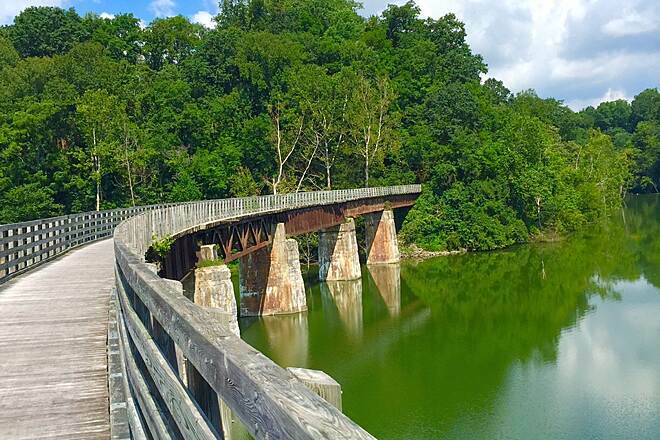 Just an awesome rail trail to enjoy with bridges, rapids, old rail stops. If you are anywhere close to this trail, I suggest you plan a day trip here. 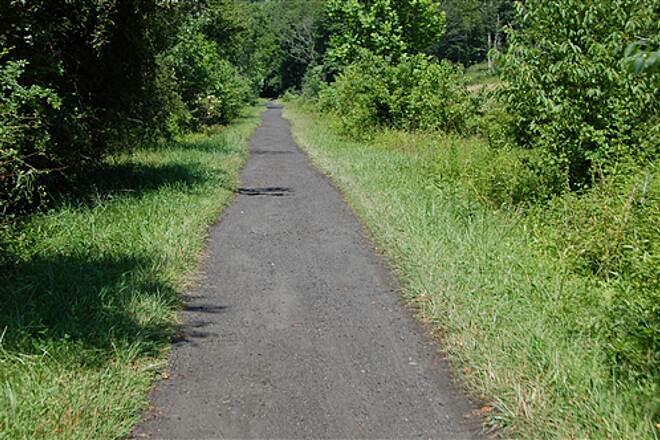 Road the VA Creeper Trail 11/1/17. 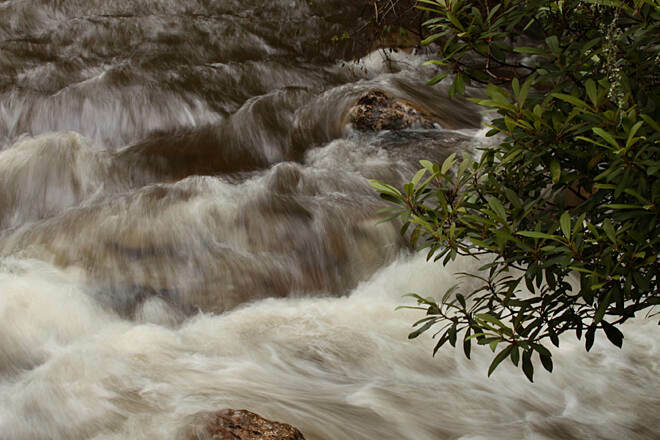 Wonderful fall colors, scenic streams and rapids to see and hear. Many scenic bridges too. Stopped for a good lunch in Damascus. Look forward to my next visit in the spring or summer. 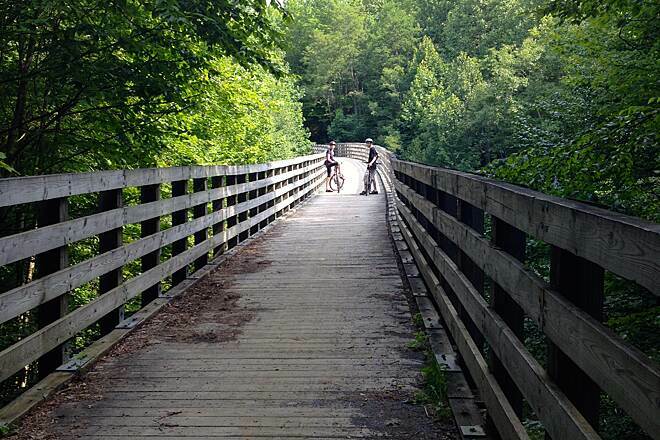 If you have been riding at all before you head to the VCT, don't be afraid to do the trail from Damascus to Whitetop. Yes it goes uphill, but it is not a steep grade and is easily accomplished. The scenery along the VCT is nice, but the trail isn't as well maintained as many R2Ts on the East Coast. 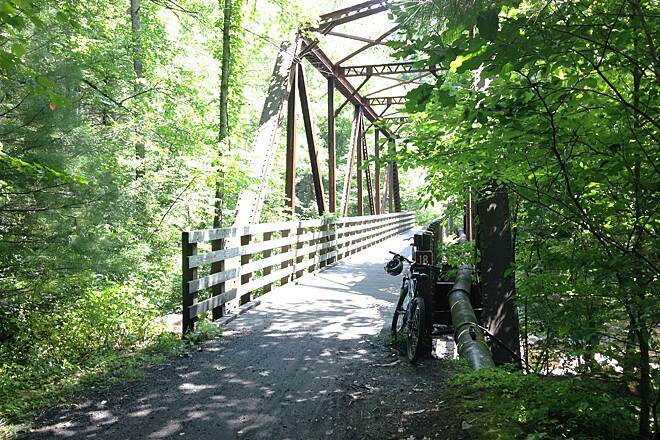 Three trails that offer as much in scenery and a better ride are the GAP (Western PA), Heritage Trail (York,PA) and Pine Creek (Wellsboro, PA). Given the number of shuttle services in Damascus it looks like the crowds on the weekends are crazy. Rode the Creeper on two warm days last November. 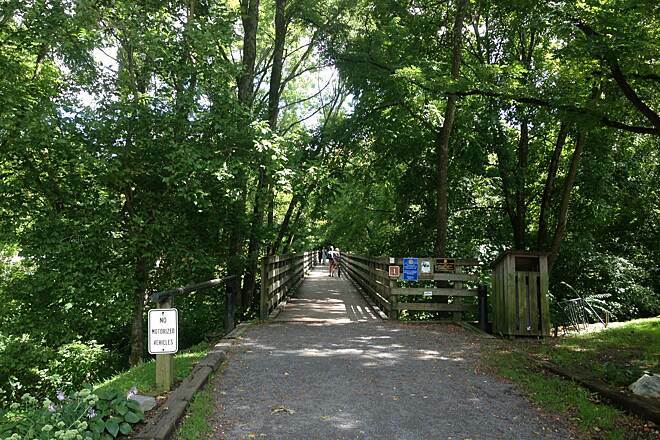 The scenery is gorgeous--one of the prettiest rail trails anywhere. Abingdon and Damascus are very nice. 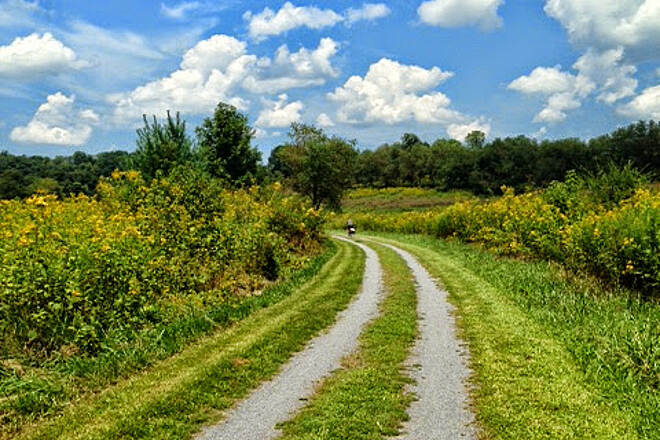 I have ridden all sorts of trails from the Katy to the GAP/C&O and this is a pretty as they come. Do not miss this trail, even if you have to travel from Alaska to get to Virginia. Who would not like 18 miles of downhill? Early this fall, my non-bike riding family (NBRF) headed to the VCT. 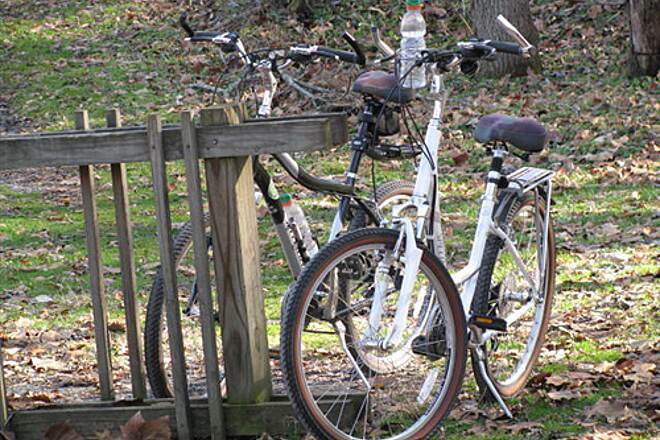 We stayed the weekend and rented our bikes in Abingdon, VA. I would recommend reserving your lodging and bikes as soon as you decide to ride. Arriving at the bike rental 30 mins. early we took the 50-minute shuttle to the top of Whitetop Mtn. The TH can become crowded even on an off-day so we waited until the “herd” left and took the spur, opposite direction of the trail, to the North Carolina state line. The first part of the 1 mile spur looked overgrown but it cleared out quickly and was totally worth the effort and is picture worthy at the NC sign. To me, the trail had a “back-country” feel to it with stops at vistas, multiple creek crossings, AT intersections and running creeks in the hollows for the entire length. 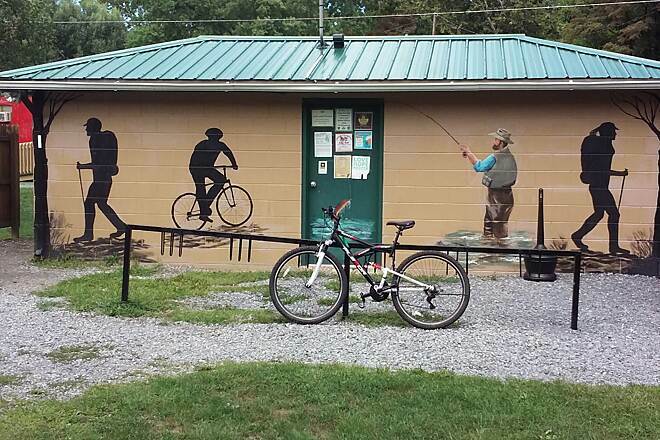 We decided to lunch at the Creeper Trail Café, all I can say is that it’s located in beautiful Taylor Valley. 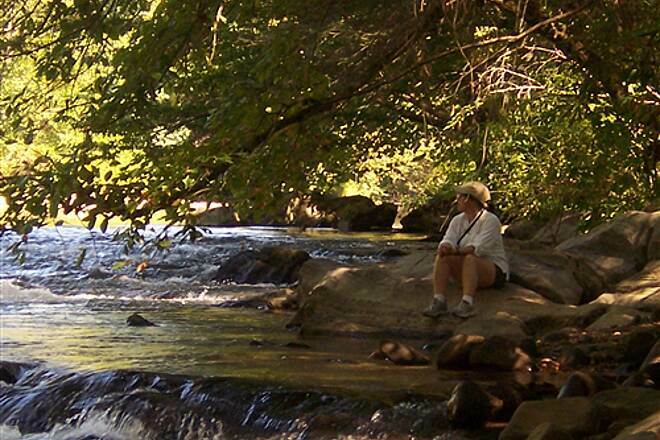 If we do the trail again, I would take lunch and stop, eat & play along creekside. My NBRF was doing their best to get to the last shuttle pick-up so they would not have to ride the second half that they missed Damacus entirely. 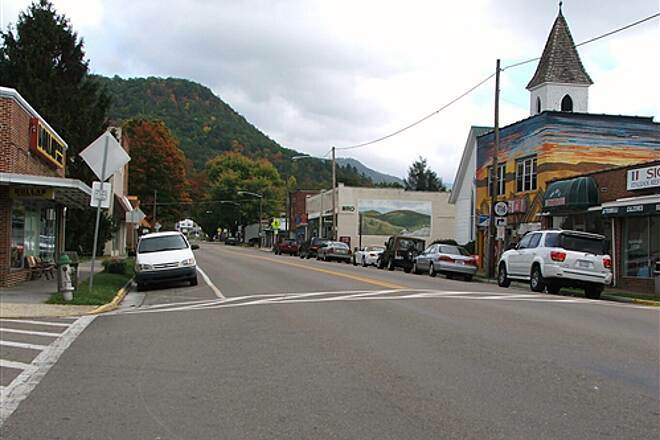 Having been to the town previously on the AT, I would recommend taking the time to explore the uniqueness of this community. The 17 miles after Damacus to Abingdon, to me, was the better half of the trail. The trail meandered through a lot of private land, grateful to all the landowners, via working farms and through grazing cattle. I thought that I got off the trail when I hit the first gate but they operate on a weighted hinge. 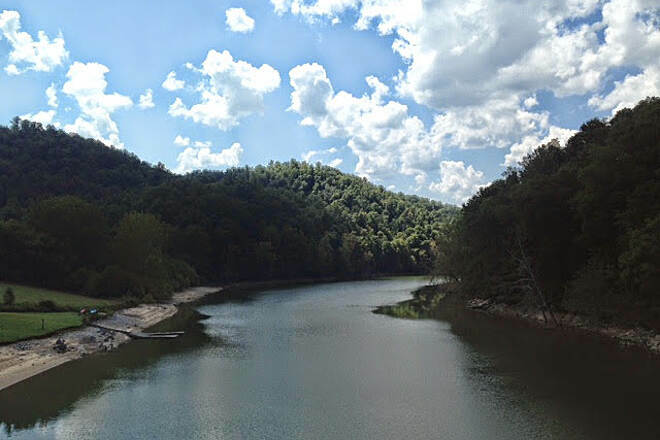 You will be riding along the beautiful South Fork of the Holston River until you encounter both the lengthy South Fork lake trestle and the magnificent curved trestle (best I’ve ever crossed) at the confluence of the middle & south forks. 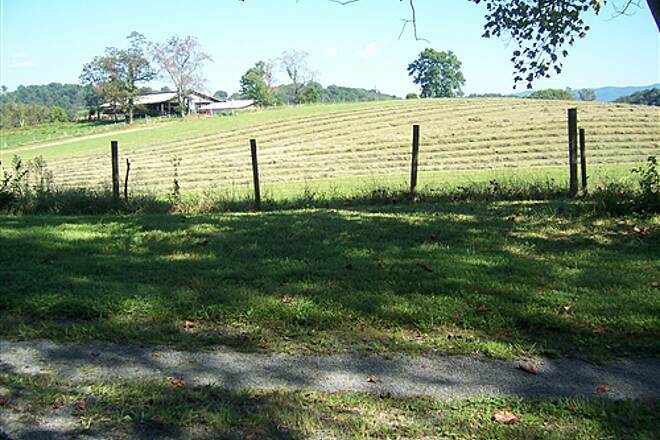 The remainder of the ride is slightly uphill through pastoral and residential settings. After 5 hours of glorious riding, I arrived at Engine #433 in Abingdon to a couple of cold Yee-Haws! My husband and I rode this trail from Damascus to White Top and back in early September. Beautiful trail!! It was a fairly easy ride since we were stopping often to take pics on our way up. The first 3 of the last 3.5 miles were more difficult as the hill grade increased somewhat. It levels back out for the last 1/2 mile. We've ridden part of the Mickelson Trail in South Dakota and I found the Creeper to be an easier ride. The only disappointment was no wildlife sitings. None. Not even a squirrel. Not many people on the trail as we started early but met a group coming down as we reached the top. 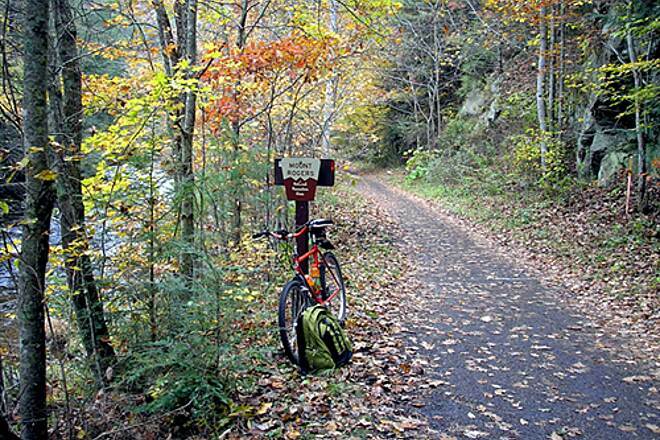 Someday, I'd love to ride this trail in the fall when the leaves are changing color. I'm normally a road cyclist, but rode this beautiful trail on a Surley touring bike. It worked, but a mountain bike with suspension would be better as the trail is gravel/dirt with a some small rain gullies here and there. Closer to Abingdon, the trail is basically two ruts through the grass, but easy to navigate. I highly recommend taking the shuttle from the bike shop at the Abingdon trailhead up to Whitetop. You won't even have to peddle for the first 1/3 of the ride down. 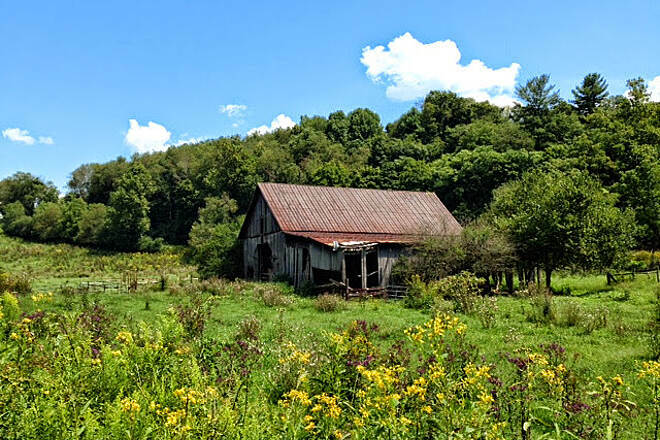 I started at the top of the mountain in fog and dense woods (chilly even in August) and biked down into bucolic farm land dotted with red barns, farm houses, corn fields and cows. This is a beautiful trail and I hope to do it again some fall when the leaves are in full color. One of the BEST - Every Biker should do it at least once! I have done the BEAUTIFUL & AMAZING VA CREEPER TR with several friends 3 times over the past few years. 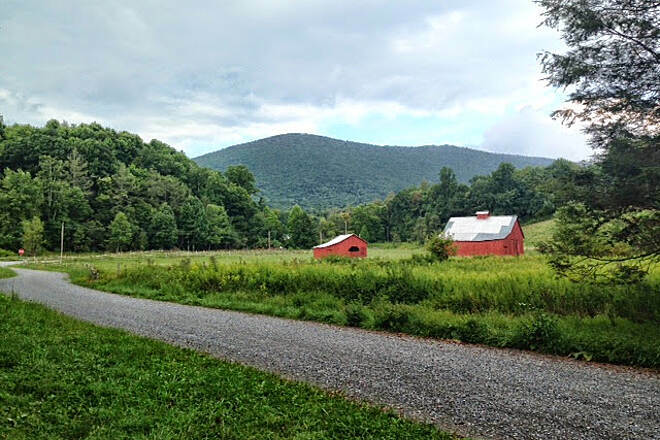 We live in Raleigh; our schedule follows: * Reserve the Hikers Inn @ Damascas VA for 2 nights * Drive in on Day ONE and ride out and back to Abingdon VA ~17 miles each way - the terrain on this half is a "big bowl" shape and not tough at all! 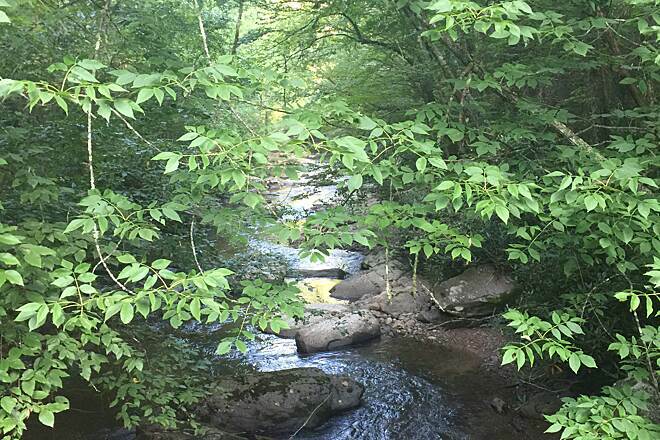 * Day TWO ride/climb up the mountain to the NC end-point and "coast" all the way back ~about 17 miles each way - The ride up the mountain has incredible sights/sounds due to the many bridges with running water & rocks - On the way up, we stop at many bridges to soak it all in! * Day THREE, if we have a car ride up the mountain, we again "coast" down the mountain before driving back to Raleigh. 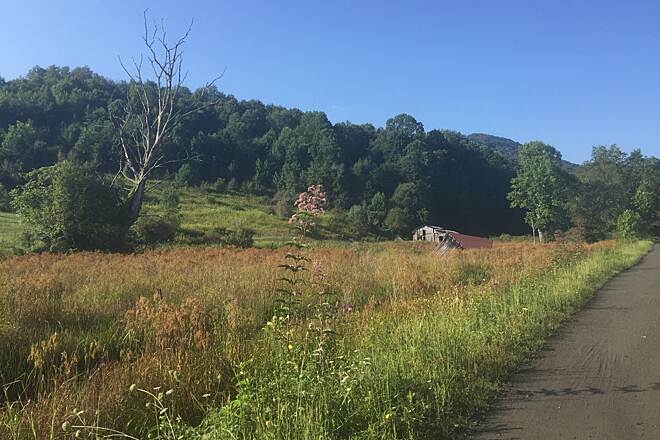 My wife and I go several times a year to the BARTER THEATRE in Abingdon VA. Over 3 days/2nights, We will attend 3 different plays and ride the trail on our Tandem Bike for 6 miles out and back each day! This makes for a wonderful 3-day weekend any time during the year! 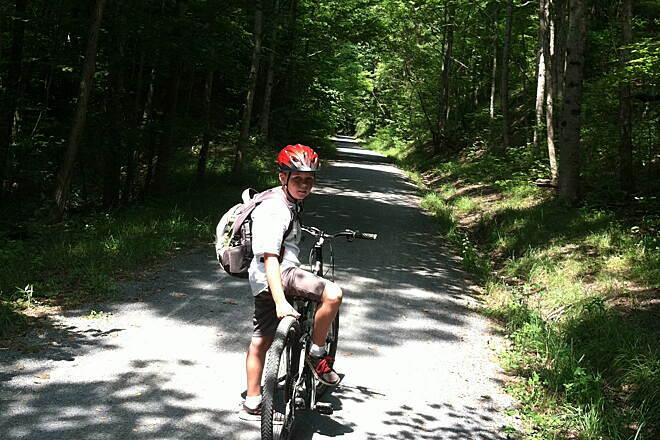 Virginia Creeper Trail - Very different that most trails. We went during the week in June. No crowds but I've heard it's different on week-ends. The shuttle takes you to the top of the Whitetop Mountain. There is NO PEDALING on the way down - the last mile has a little pedaling. Not really exercise but I would still recommend the trip. It is almost all thru the woods. 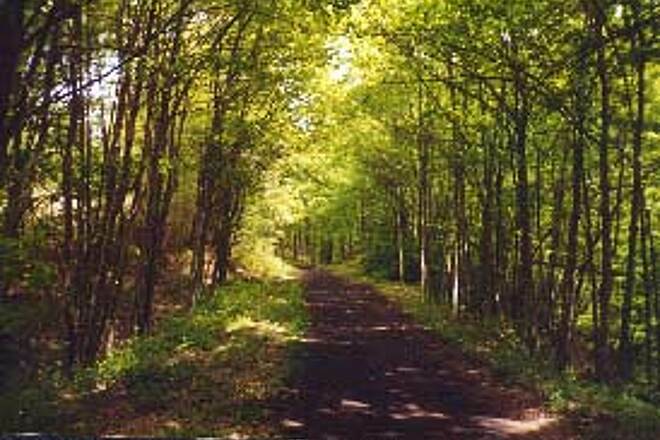 The woods are beautiful and the construction of the old rail trail is impressive. Damascus To Abingdon - We took a shuttle to Abingdon and biked back to Damascus. The trip is 18 miles one way. Roundtrip would have been a little much for us since we did the Virginia Creeper trail in the morning. When leaving Abingdon the trail is slightly downhill most of the way to Damascus. Except for the last 3 miles, it is all shaded. A lovely scenic trail. Well kept. We stayed in the lovely little town of Damascus. So many ways to enjoy this trail! Today, my husband and I started at Abingdon and rode to Damascus and back. Love the trestle bridges! 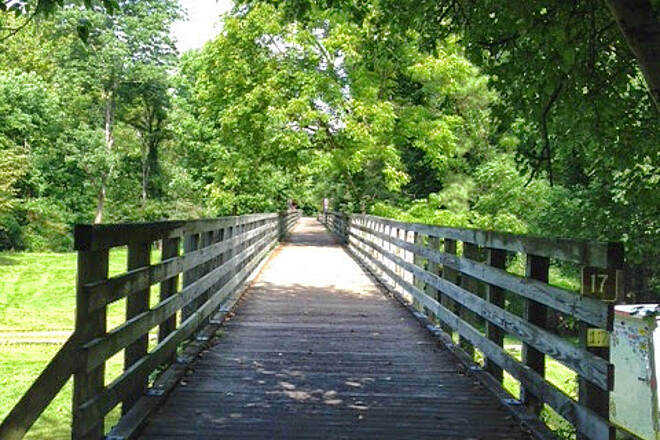 The trail alternates between green meadows and lush green shady forests next to the river. We have taken the shuttle from Damascus to Whitetop and ridden down before. We have parked in Damascus and ridden to Abingdon, lunched, and ridden back. ONE TIME we ride from Damascus up to Whitetop and back. We were pretty proud of ourselves for that one. We are both in our early fifties, fairly fit, but by no means do we ride regularly. 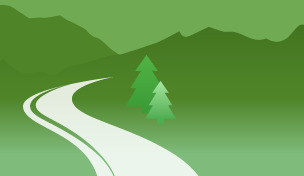 It is a very do-able trail for all levels due to the variety of ways you can go. It does get busy on the weekends. We particularly enjoy it during the weekdays when it is less crowded. If you're looking for a good climb! Looking for a good climb I rode the Virginia Creeper Trail for the first time starting in Damascus climbing to top of Whitetop Mountain, the N.C. border and back down really enjoying the challenging ride. That Friday in late April it rained steady with temps in the low 50's. The good part was that I didn't have to compete with the crowds of bike tourists gliding down from the top that I'd read about on this site. I crossed paths with a couple of hikers and maybe five bikes heading downhill. I rode my cyclocross bike with 32mm cross tires that worked great. The climb was a steady moderate grade with the last 3 miles or so becoming steep with what I'd guess was a 10-12+ percent grade good for some burning legs. Even with the rain the scenery was spectacular. 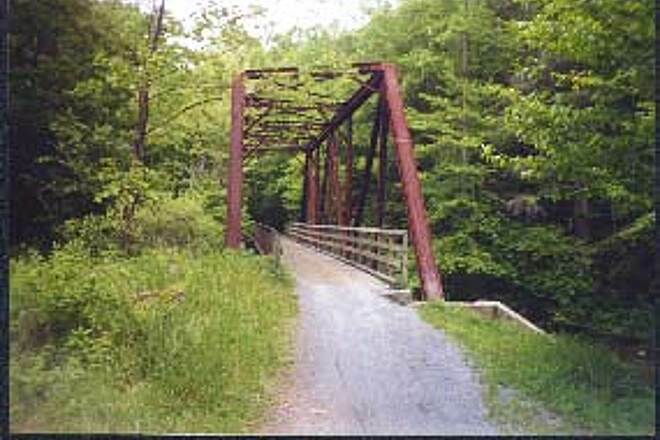 The trail follows a beautiful rushing stream through dense forest the with large boulders, a good number of nice bridges some built on the old trestles, cool little villages and old train stations with relics such as old rail cars. Given the chilly conditions and that I had become soaked to the bone the glide back down turned into a survival ride possibly verging on the beginning stages of hypothermia. My fault for not choosing the correct clothing for the conditions since I was expecting it to soon clear up to which it never did. Overall I give this trail 5 stars and plan on going back during the summer heat to ride the entire length. plenty of runners, myself included. 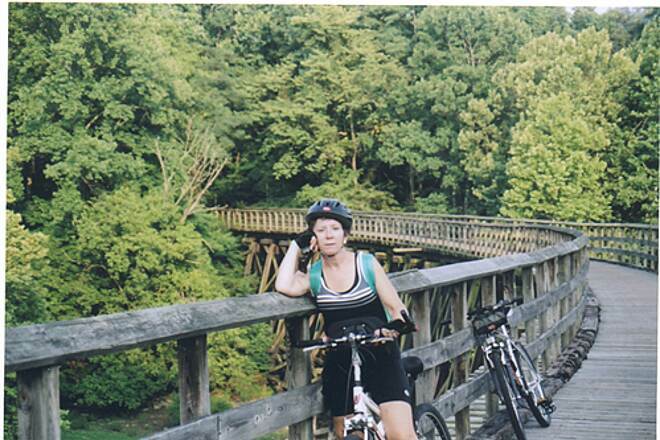 I have ridden plenty of rail trails and bike routes. This is among the best. The town of Abingdon is charming as well. 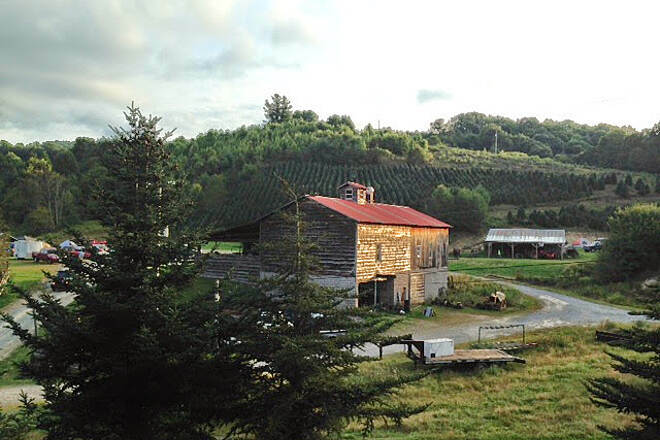 The perfect trip is an historic downtown B&B in Abingdon, bike to the microbrewery by the tracks, and then the eclectic morning coffee shop, to the shuttle, get to the top and ride back to your digs. Don't drive your car for two days. We did the entire length. The portion from Damascus to Abingdon was delightfully underrated. I enjoyed it as much as the first half, and practically nobody was on the trail. October colors are magnificent. Do pay attention to bike path etiquette if crowded. Many folks will not respond to a bell but only a voice announcement prior to passing. Came to VA specifically to ride this trail. Although the weather could have been better, we thoroughly enjoyed ourselves. The ride from Whitetop to Damascus was beautiful. I don't think I've ever coasted for 17 miles without having to pedal much. The section from Damascus to Abingdon was very enjoyable too. The farm land was lovely. 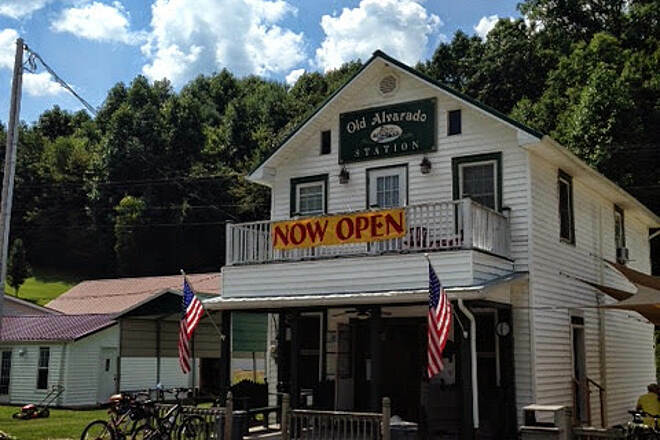 When going through Alvarado make sure you stop at the Old Alvarado station store. They have the best home made pie and ice cream at very reasonable prices. I highly recommend this trail. It was very crowded on the weekend so I would recommend going mid week if possible. This trail is absolutely beautiful and full of scenery and lots of stops to rest and to capture the beauty of nature.......we did take our road bikes and would not advise this..my husband blew his tires 3 times......so mountain tires for sure........the trails were in great condition and well maintained.....we will diffinitely do this again. 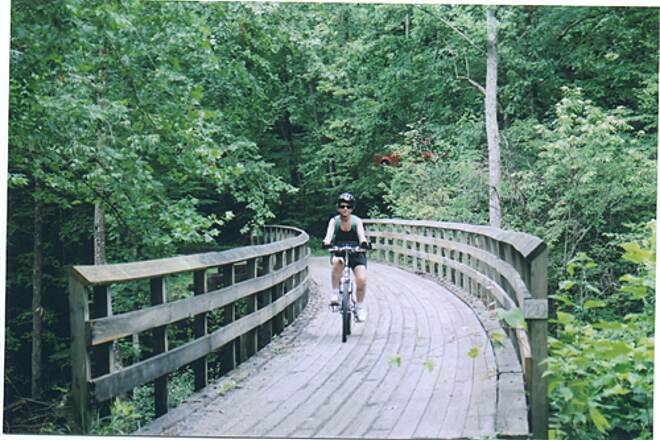 The trail is great for walking, biking, or horseback riding of all ages. Some areas are softer ground than others, but very easy to navigate. 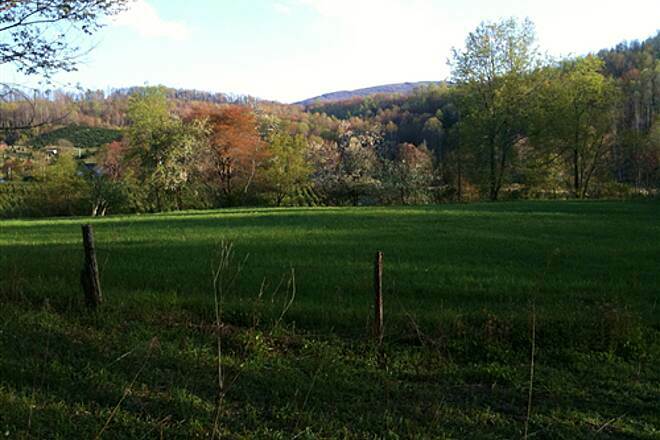 Lots of river and forest views, some farmland... Good for moderate riding/walking from Abingdon,VA . Four of us-3 in our sixties and one 71 yr old were taken to Whitetop at the top by the company from whom we rented our bikes. We rode 17 miles to Damascus where the bike company picked us up. very nice ride; absolutly beautiful. That portion was mostly downhill, but fairly gradual since it follows the old rail line. Beautiful bridges. The section we rode was well marked with some occasional places to stop and sit down if you want. I would definitely do this again. My husband and I are in our fifties and take an RV vacation camping trip once a year or more. We like riding our bikes while on vacation but hardly do it any other time. 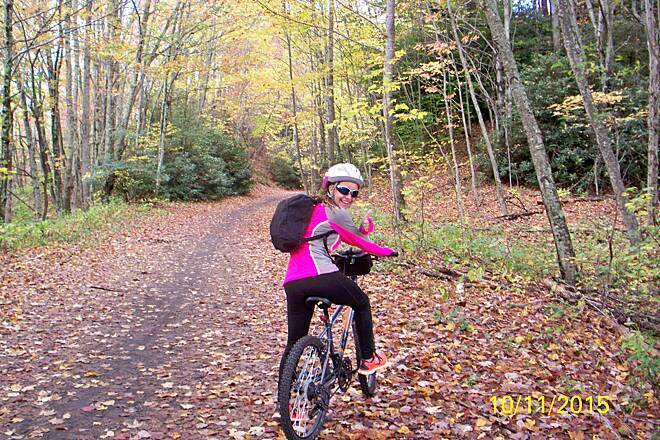 The Virginia Creeper trail was our destination this year. Weather was calling for 60% thundershowers with a window during mid day. We didn't want to commit to the shuttle and downhill spin, so we started at a parking area just above Damascus. We rode 7 mile up, never getting off our bikes because of burning leg muscles. We stayed in second or third gear most of the time. I rode my daughter's bike from when she was in 7th grade and never thought we were actually going up that steep. When we turned around, we realized how steep it really was. I think I enjoyed the beauty more than most people by taking it a little slower. I can not wait to go back!!! My best friend and I took a shuttle to White Top Station and rode down. It was absolutely beautiful with the Laurel blooming & the sun shining thru the trees. I'm planning to go back with my kids and make another great day out of it! Ride this trail every third Saturday in October since 2011, and every Memorial Day with my church youth group since 2014. Also ride periodically with friends. 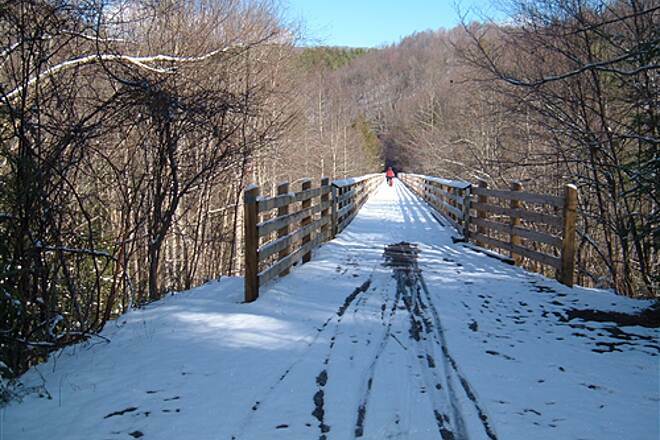 Would love to see this trail opened into North Carolina at least to Lansing; it would bring in quite a bit of tourist dollars to Ashe County NC. 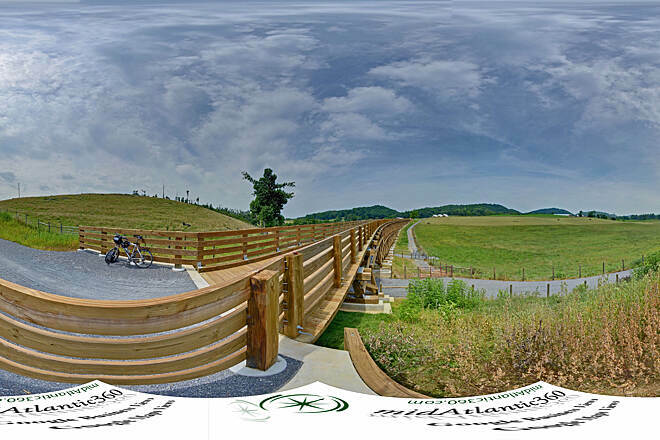 My wife and I rode this trail a couple of weeks ago from Abingdon to Whitetop, and back, and loved it. 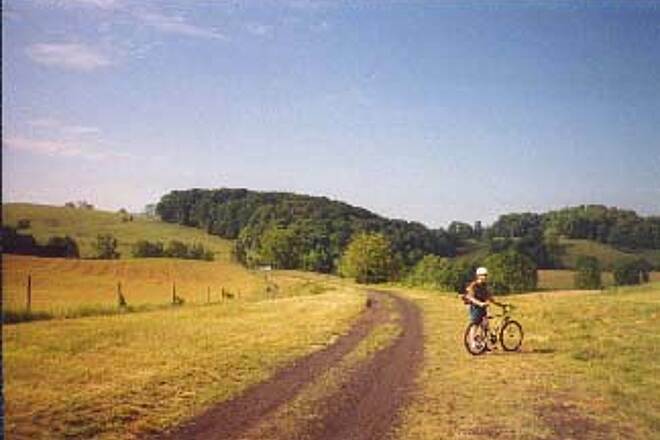 We've ridden many of the trails in Pa., Md, and W.Va. This one is right up there with the best of the others. One small detail that the description doesn't mention is the grade of the trail from Damascus to Whitetop. 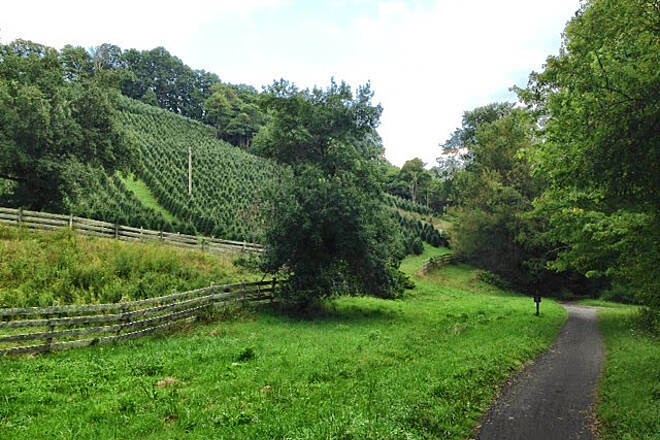 Over a distance of about 14 miles, there is an uphill climb of about 1600' which works out to a grade ranging from 2% to a maximum of about 5% closer to Whitetop. This is why many people take the shuttle to Whitetop, then ride to Damascus. You're able to coast the majority of the way. We were looking for a little bit more of a challenge than that, so we rode the entire trail both directions. 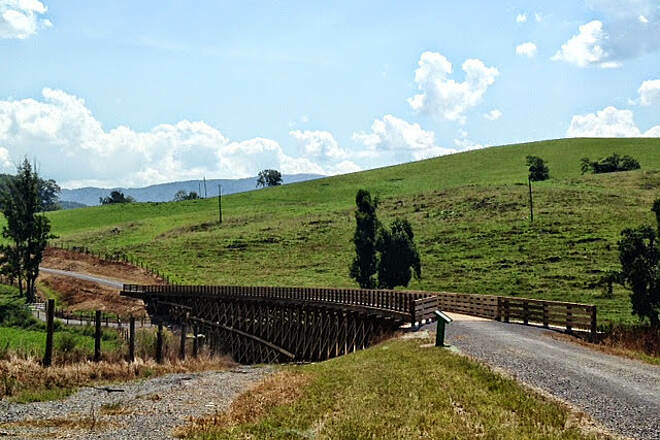 Granted, we felt it in our legs by the time we got to the top, but if you're an experienced cyclist, looking for something a little more than the run-of-the-mill Rail Trail, this one's nothing you shouldn't be able to handle. As for it being a little rough, the eastern end (towards Whitetop), is just a little bit rough, nothing that I would consider terrible. We rode it on cyclocross bikes with 32mm tires, and made out fine. Don't know that I'd recommend doing it on a road bike though. The surface is all packed tight, (no loose gravel that you would sink into). In my opinion, its "roughness" is nothing that will prevent us from going back and riding it again. All in all, we both loved it, the diversity of the scenery is awesome, and if you ride the entire trail, it's a great work-out. Highly recommend it. Rode this last week with friends on a Monday so not a whole lot of trail traffic. It was our first time but they had ridden it many times. We stayed at River Trail Cabins right next to the trail in Damascus and rode into town then took a shuttle up to Whitetop. It started out a beautiful day but about 10 miles into our trip it poured and never slowed down so just rode directly back to our cabins! We still had a great time and I would highly recommend it. A very easy ride with a lot of scenery! Looking forward to riding it again. My wife, father and I rode from White top station to Abington. The first half to Damascus was a little rough. A lot of people coming down the mountain. The second half of the ride was much more pleasant. Not quite a scenic but a lot less people. We had a blast over the whole ride. We are looking forward to doing it again. The trail of many bridges! 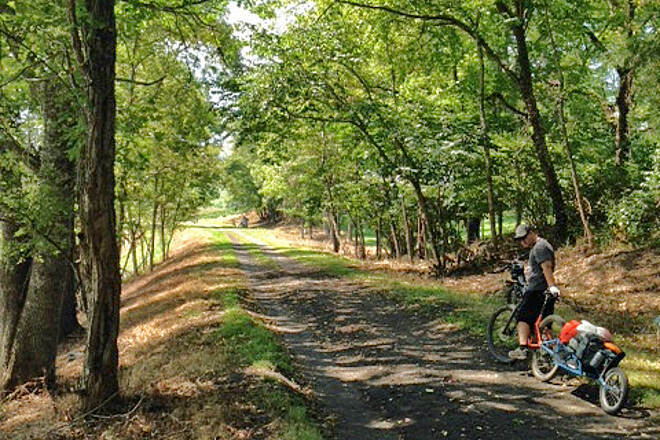 My trip review covers biking from Abington to Whitetop, camping overnight and then returning to Abington. For reference, I’m a 41yr old male riding a full rigid single speed mountain bike (27.5x2.5in tires) pulling a BOB trailer loaded with camping gear. Also biking with me was a 30-something year old female on a hybrid bike (700x38mm tires). We parked in the parking lot at the Abington trailhead. This is actually the “end” of the trail if you are following the mileage markers and bridge counters. It’s a large gravel lot with plenty of parking that was able to accommodate the busy holiday weekend crowd. I felt comfortable leaving my car in the lot overnight (not the case on some other trails I have been on). Within the first few feet of starting the journey you cross your 1st bridge. At the end of the bridge is a restroom. It was clean and well maintained. The trail is covered with fine gravel and is fast rolling. It’s slightly downhill as it rolls past farmland. 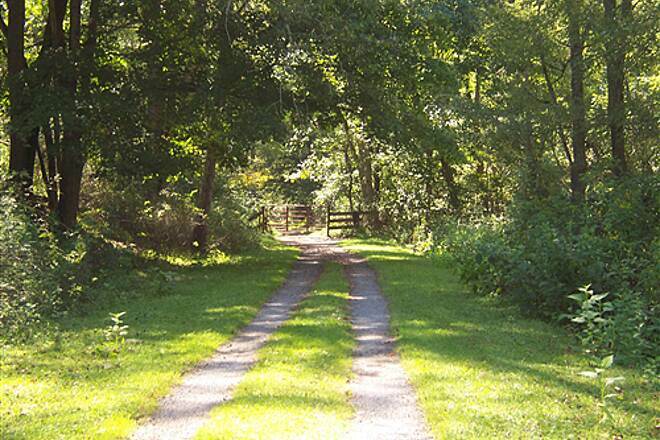 You will have to stop and open several farm gates on this section of trail. We passed a few other bikers, a couple joggers and some walkers. We did not see any horses using the trail. You often will find yourself in the direct sunlight due to less tree coverage. When we reached the trail midpoint (Damascus), we stopped for lunch. It’s easy to find places to eat because they are in close proximity to the trail. This is where we noticed a LARGE influx of trail users. The Application Trail (AT) intersects her and we saw several hiker/backpackers. The trail increases in steepness as you head to Whitetop. The surface is slightly rougher with no gravel in many places. The tree coverage thickens and most of the trail is shaded. Bikers. They started descending like a locust plague. There were 100’s and 100’s (no joke) of them and they generally came in waves. They were the people who were shuttled to the top and were coasting down the trail. It was very obvious none of them received any type of “trail etiquette” brief by the shuttle companies prior to being cut loose. They were all over the trail and oblivious to their surroundings. More than a handful of times I had to take evasive action to miss a head on collision. There was a couple of people who were riding along and smoking. You want some smoke or ash in your face? No thanks. They would stop in large groups on the trail and block it. Their existence on the trail ruined what was a pleasant bike trip. Once we reached Whitetop we continued on the road (downhill) for about half a mile to the Creeper Trail Campground. Its location was perfect. However, I was not overall impressed with the facility. The sites were on top of each other. 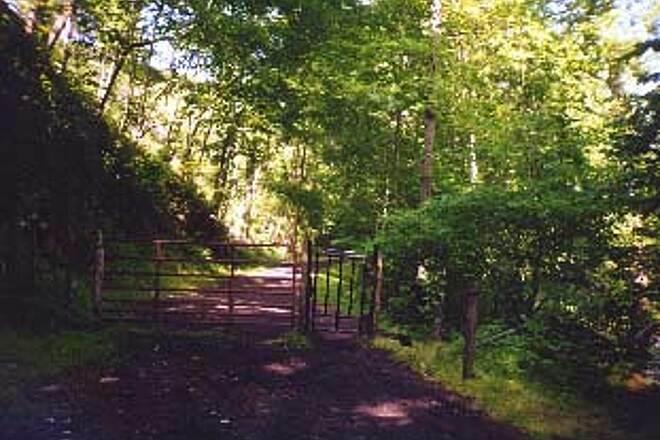 Be prepared for a short but steep climb to the campsites located further away. The bathrooms were clean and the staff polite. We had blown a tire on the ride to the campground and had no spare. We contacted a local bike shop in Damascus and reserved a spot on their return shuttle the following morning. Because we rode the shuttle from Whitetop to Damascus, we were able to miss all that fast downhill riding. Err…speedway debacle. The rest of the ride back to Abington went smooth. I could not give it 5 stars due to the out of control downhill bikers. So -1 for them. Scenic but wish it was longer! 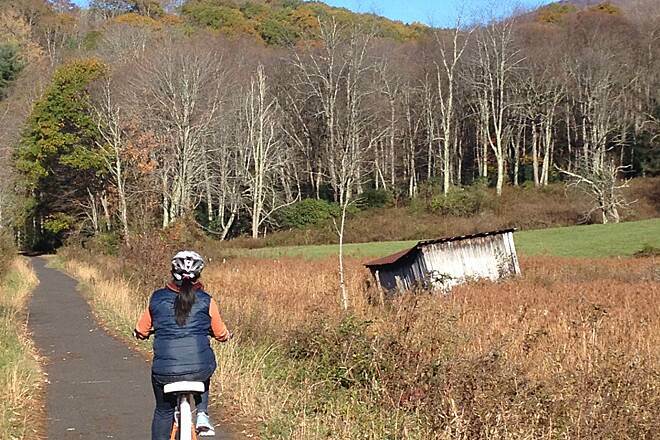 We rode the entire Virginia Creeper Trail over two days last weekend. 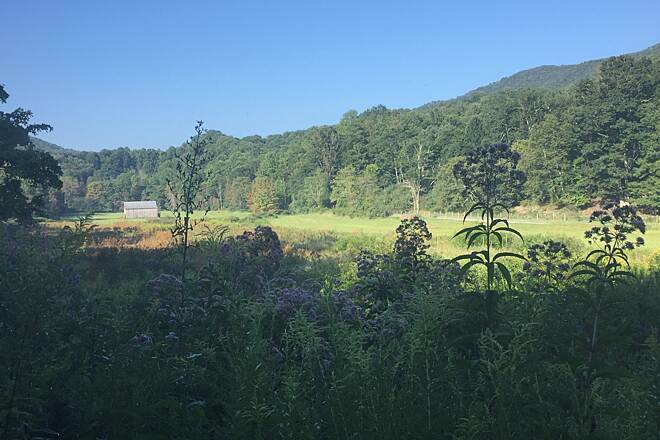 We stayed at the Hikers Inn in Damascus and rode from there to White Top Mtn and back on Saturday, and to Abingdon and back on Sunday. The section from White Top to Damascus is much steeper, altho still not that bad, and much more crowded due to the bike shuttle companies hauling cyclists who are too lazy to ride to the top! We enjoyed the ride but the downhill portion was a little too crowded to fully enjoy. We liked the Damascus to Abingdon section better due to fewer crowds and gentler terrain. Scenery was not quite as spectacular but very nice. I highly recommend the Hikers Inn as a place to stay. 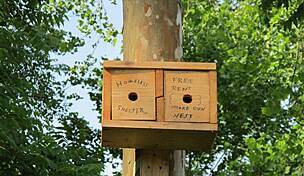 Altho the inn does not serve breakfast, rates are very reasonable and rooms nicely furnished and clean. awesome trail, me and my husband and kids 8yr old and 6 yr old rode this trail, very well kept up!! We will go back kids had fun and so did we. The last 3 miles is work but fun its all flat and you have to pedal instead of coast. Best trail ever!!! Awesome ride last weekend. My wife and stayed at the Quality Inn in Abingdon Friday night and left from there Saturday morning. 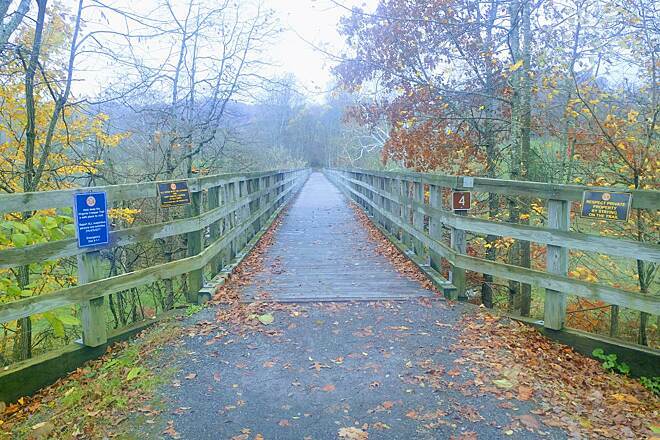 The trail from Abingdon to Damascus is flat with a couple of beautiful trestles. One is brand new, having just reopened after being destroyed by a tornado. It's quiet and secluded with very few riders. 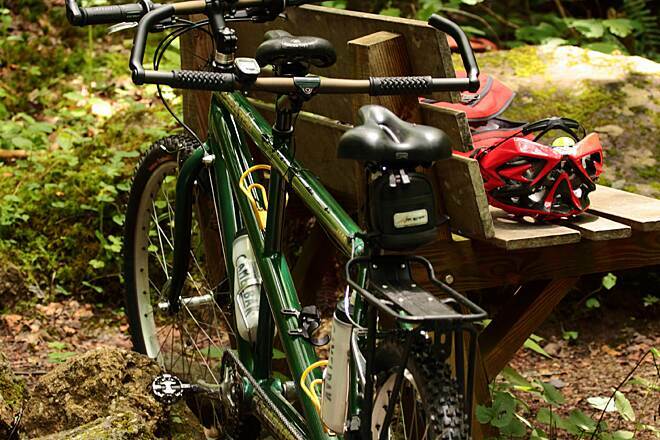 The main Virginia Creeper Trail activity is bike rentals and shuttle service to the top. Most riders ride down from White Top to Damascus, very few ride up. Starting up in the morning we were ahead of most of the downhill traffic. We could see the bike shops loading up for their first run (around 10 AM) as we passed through Damascus. When we arrived at White Top around lunch time the area was buzzing with groups preparing to leave for the ride down to Damascus. We noticed the trail kept going and we rode another mile to the NC line - End of the trail sign. We ate lunch and by the time we started back most of the Downhill traffic was ahead of us. We had a great time and would recommend this to anyone looking for a long trail ride...total distance 70 miles out and back. PS. We rode straight bar road bikes. We changed our 23mm road tires for 40mm cyclo-cross tires and had no trouble navigating the smooth gravel. 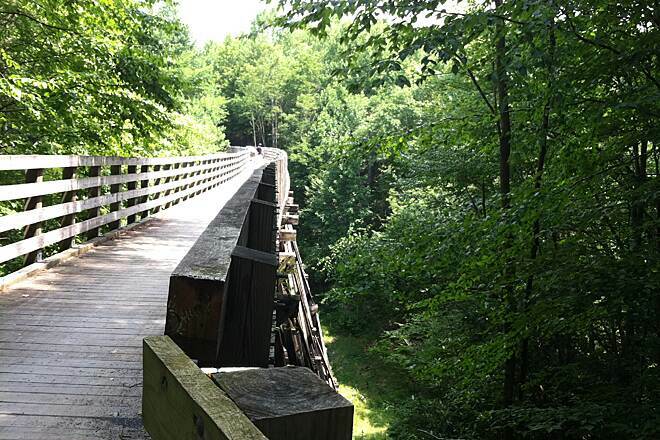 Virginia Creeper Trail...the other part. Having ridden the Creeper Trail from White Top to Damascus many times, I decided to ride "the other part" a couple of weeks ago. From the caboose in Damascus to Abingdon and back was 32 miles and was a very pleasant ride. Pretty flat...any "uphill" parts were barely noticable. While not as pretty as the White Top to Damascus portion, the ride was actually more enjoyable due to the fact that there were very few people. On the day I went (a Sunday), every bike in town was rented and the White Top to Damascus porton was one continuous line of people. Ugh...no thanks. I'm sure I'll take out-of-towners on the White Top to Damascus ride again in the future, but "the other part" has become my favorite. I can easily see making it a monthly excursion. We did the trail from Damascus to Whitetop on the Labor Day weekend and had a lot of fun. The weather was cool and enjoyable. The trail showed some wear-n-tear, especially after all the summer rains. Lots of ruts, but still a fun experience. On our return journey back to Damascus we got caught in a rain storm and got soaking wet. Eventually we made it back to Damascus, only to realize that we all looked like skunks, (and maybe also smelled like them) because we had a black mud stripe all the way down own our backs from the mud that came off of the tires. Thankfully we found a garden hose and was able to wash down and get cleaned up. We stayed at Green Cove Cabins, a jewel in the mountain and highly recommended! No cellphone service, only peace and tranquility! We had decided to stay in Abingdon and take a shuttle to Whitetop. The plan was to ride back to Abingdon. We made it to Damascus and were enjoying a wonderful lunch when the storms rolled in. No problem, we took the shuttle back to Abingdon. The next day we started in Abingdon and planned to ride to Damascus and back. This time we made it about 2 miles from Damascus when the skies opened up. We put on our "emergency" ponchos and continued on to Damascus. We ended up back on the shuttle to Abingdon. Despite the weather problems this was a great trail. The downhill from Whitetop was a lot of fun with great sights everywhere you looked. The ride from Abingdon to Damascus was beautiful with grazing cattle and awesome bridges. There is a detour that was kind of steep around one of the bridges that is out. We walked our bikes and got a little workout.All in all it was well worth the drive from Michigan. We left from the B&B we stayed at in Abingdon and rode to Damascus, then took a shuttle up to White top and rode back to our B&B. A 52 mile round trip. The section from Abingdon to Damascus seemed to have less traffic.From Whitetop to Damascus, you can coast if you want.Lots of traffic at Whitetop with families. So be patient because, little children don't want to move to the left and you can very quickly run them over. You generate a lot of speed on the descent from Whitetop. Lots of scenery to take in. Enjoy it all. May try to ride it again in the fall. My husband and I are both sixty eight year old with some mobility problems and trying to find ways to have fun with good exercise. This trail was doable on our hybrid step-thru frame bikes. We had a blast. Next spring I have planned a trip with my daughter, granddaughters and niece. They are experienced riders and I know we can have fun and it will be like play for them. I now plan on more trails with more difficulty. 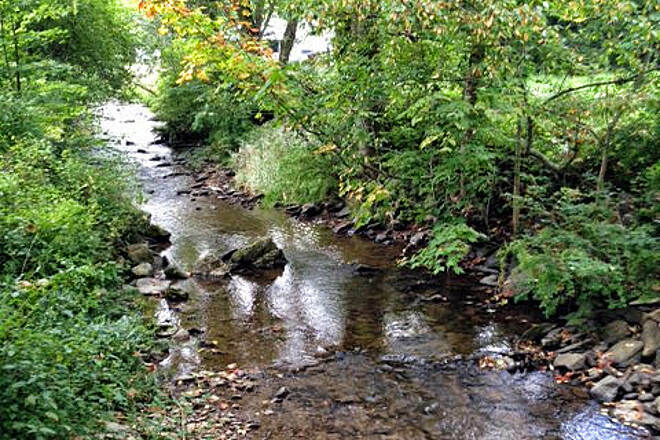 VC is a beautiful trail with many spots to stop and see the white water trout stream that flows along beside much of the trail. The many trestles and bridges are another bright spot. We had bread to feed the trout at #33 and sure enough rainbow trout darted out to nab the bites. I can imagine that as busy as the trail was on mid week in October that summer weekends might be crazy crowded. We did make the mistake of parking at Whitetop and planned getting shuttled back to our car and even if all the services say they run until 6:00 in actuality most stop runs back to Whitetop after 2:30. We had a hard time getting a shuttle and after calling all of them got the last one at 5:30. Next time we will park at the bottom either Damascus or Abingdon and shuttle to the top. Then we don't have to worry when we arrive. Our car will be waiting at the end. My friend and I rode the Creeper the summer of 2011. It was completely reopened at that time. The surface is mostly excellent with gravel fines. The grade is more than manageable. The ride from Damascus to Whitetop was the steepest. As other reviewers have said, those who ride only down from Whitetop are a hindrance, not obeying the rules of the road, etc. Many times we were told we were going the wrong way--sad. It took awhile to get up to Whitetop but the trip back was lightning fast, riding the brakes most of the way. We did ride from Whitetop toward the border and the trail here is pretty rough. The rest of the Creeper was very enjoyable and I definitely will be going back to ride again. We rode from Damascus to White Top on our recumbent tandem. You do climb for most of the trip but the steepest grades are no more than 5%. The trail surface is good, perfect if you have a hybrid or mountain bike. So much fun to climb to the top and coast all the way home. Drove up from Charlotte, NC and stayed overnight in Damascus over Labor Day weekend. First time for us and probably a very busy trail weekend. Rode up to Whitetop and back on Saturday and to Abingdon and back on Sunday. Wife and I were on singlespeeds with our 10 & 12 year old boys. No shuttle here. Knocked out the "uphill" sections before the gentle descents back to Damascus. There was once a train on this line so we didn't find it all that difficult. If you have gears, some experience and the time no need for the shuttle. By the time you go through all that you'll be halfway up. Did have some motivational issues with the 10 year old going up to Whitetop. 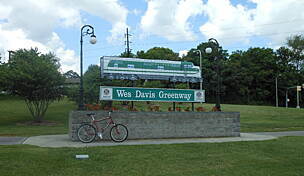 Stopped frequently, took 3.5 hours that included watching a folk band at the Green Cove Station. Trail well marked. Had to watch out for inexperienced cyclists coming down. Made it back down to Damascus in 1.5 hours without really stopping. Kind of a thrill ride, very fun and easy pedaling. The section to Abingdon the next morning was less of an uphill. Entire section was open. Very nice, scenic and pastoral. Managed to get there with frequent stops in about 3 easy hours. Again coming back was about 1.5 hours. Less people on the Damascus to Abingdon and back section. Happy to have covered the entire trail basically twice over the weekend. 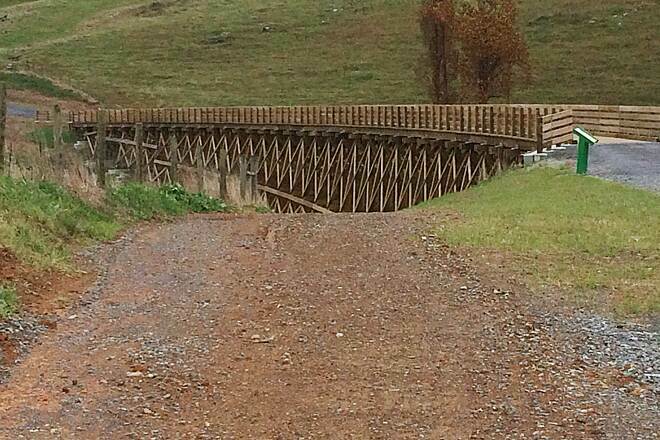 Nice trestle bridges, kind of tight in some areas. Need to bike defensively with less experienced cyclists on the trail. You can tell some of them biffed by their skinned up shins. Nothing technical on the trail, just stay to the right. Downhill to Damascus from either endpoint is an absolute breeze. 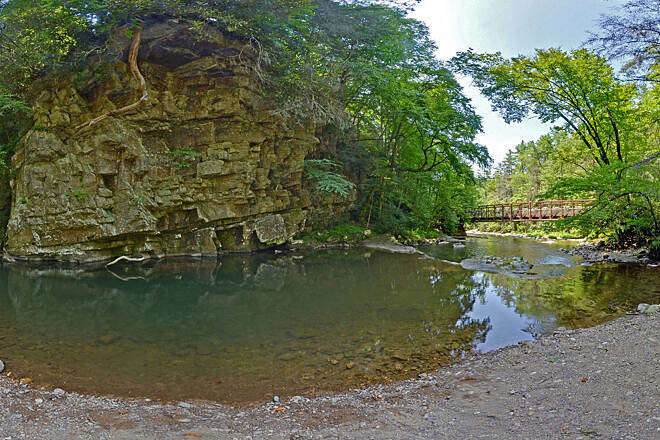 Check out hikes at nearby Grayson Highland State Park about 1 hour away from Damascus. We plan on going back again! Highly recommended. Fun trail, run like an amusement park - but still fun. I met my uncle down in southern Virginna for two days of late October trail riding. We hit this trail the second day, after riding the New River trail the day before. Both were great, but for different reasons. After having done 55 miles the day before we wanted a more leisurely ride, so parked at Abingdon and called a shuttle service to take us to the top of Whitetop mountain, from where we would ride back to our cars at the other end of the trail. There are a lot of people that do this - I mean a lot. While were were being unloaded, with the 10 other passengers in our shuttle, two other full vans showed up to unload. The shuttle service we hired had at least 8 vans, and they weren't the largest outfit. I can only imagine the crowds they get barreling down that mountain on summer weekends. Yikes! Mental note - only do the Virginia Creeper off summer, on a weekday. That being said - it really is a very fun trail. I was glad I brought my mountain bike for this trail, especially the first half going down off the mountain to Damascus, although most folks were on hybrids. The trail surface isn't nearly as smooth as the New River Trail, but still wasn't too bad. You can basically coast for about the first 15 miles - it's all downhill. I would love to get up there pre-dawn to do a run off of the mountain without having to worry about running into someone - I bet you could beat the shuttle back down. Too many folks going down to do this - but it's still pretty sweet. I actually enjoyed the run from Damascus to Abingdon more. It's more remote feeling as most of the shuttle born folks stop at Damascus. 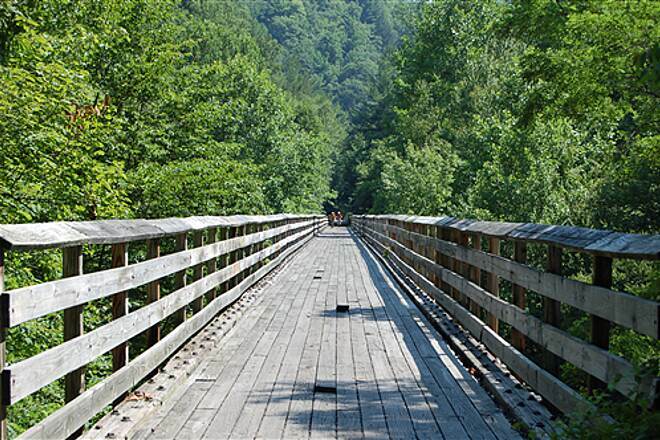 You cruise through cow pastures and across many high bridge trestles - great scenery. I'm told some of the last three miles is uphill...if it is it's so gradual you won't even notice it. The whole trail is a very easy ride - you won't get a great workout, but you will enjoy great scenery and have a fun morning in the saddle. I was on the damaged section of the Virginia Creeper the last of June, 2011. The debris from the tornado has been cleared. The minor damage to two small trestles has been repaired and the wood from the large trestle through the pasture has been removed. It was reduced to small pieces and completely demolished. There is a short, but steep gravel section now allowing access until the new trestle can be built. 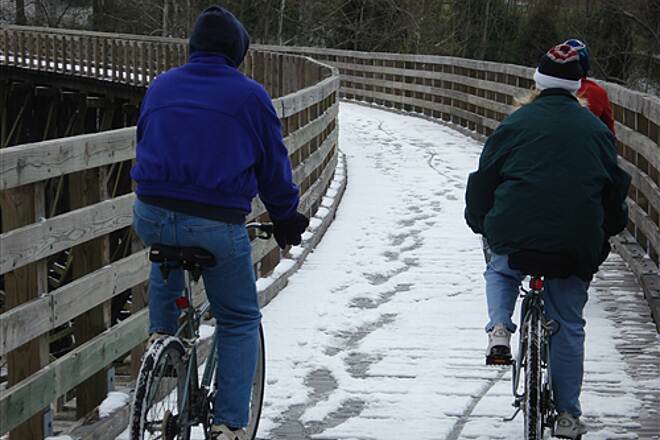 It is rideable or easily walkable - your choice, but dont let this stop you from going. It's a wonderful experience throughout this beautiful trail. 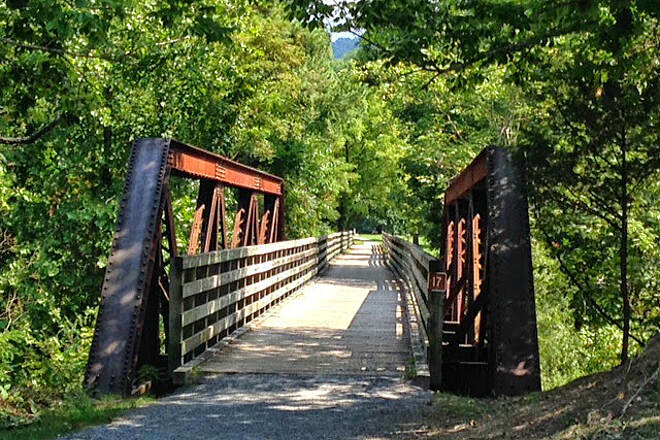 The Virginia Creeper Trail is open from Whitetop To Abingdon. We biked the stretch from Whitetop to Damascus with a 3 and 1 year old. The trail was in good shape and the scenery was beautiful. We especially enjoyed the many bridges that span gorges and the ever present mountain stream (the stream holds native trout so pack your fly rod if like). Creek Junction was my favorite place on the trail. 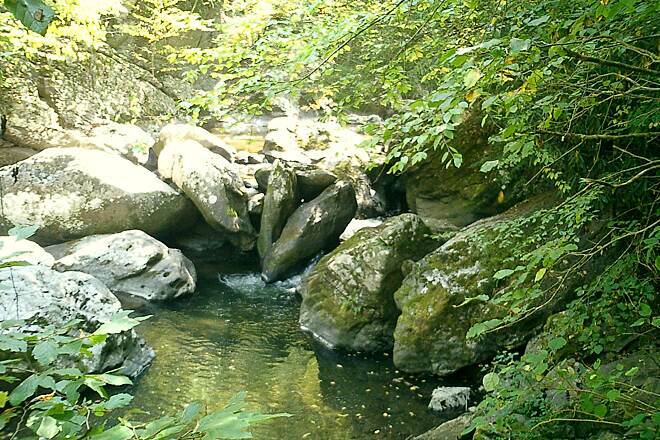 It provided a good place to get the kids out and cool off in the stream. The Trail Link map, description and reviews were a huge help! Thanks for the great resources. If you haven't seen them yet, check out the Rails to Trails series of books for a great on the trail resource. One minor improvement I can think of is to provide a little more signage on the trail itself. There are nice rental cabins available near the trail and the bike rental shop at the top of the mountain was awesome. They ran a late shuttle for us back up the mountain because we got a late start. Good people and great service. I highly recommend this area for a enjoyable family destination. 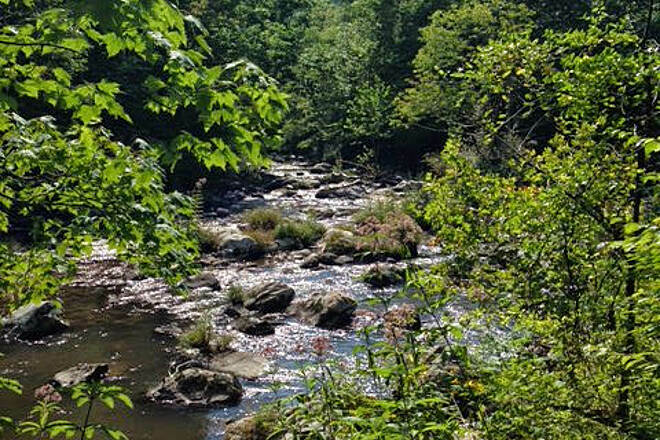 Grayson Highlands State Park is nearby and provides plenty of incredible hiking as well. FYI, we couldn't get any cell phone coverage on the trail and very little in the entire area. 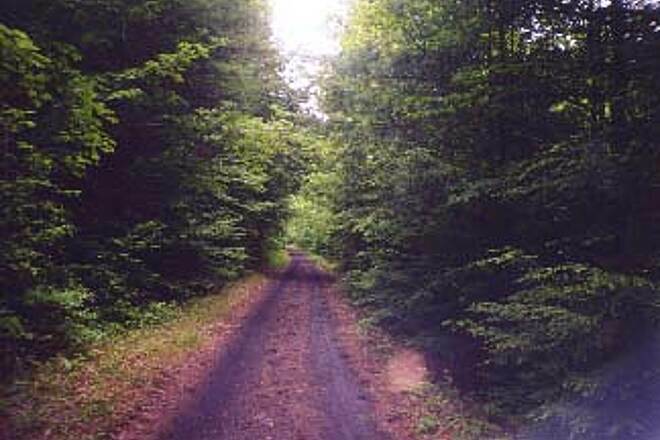 I rode this trail from Whitetop Station to Damascus. The Green Cove Station was amazing and well worth a visit. The volunteers working the day I was there were delightful and shared a wealth of knowledge. I stopped in Damascus and found it to be a lovely town. The folks at the town library will let you use the internet for free if you want. Dirt pathway. It was fairly muddy in spots owing to recent heavy rains. Also, contractors were doing maintenance to some of the bridges and may close the trail for short periods of time (though I only had to wait about 10 minutes before they let me through). A suspected tornado destroyed one of the trestles on the western end. I was told that the section from Abingdon to Alvarado was closed indefinitely. 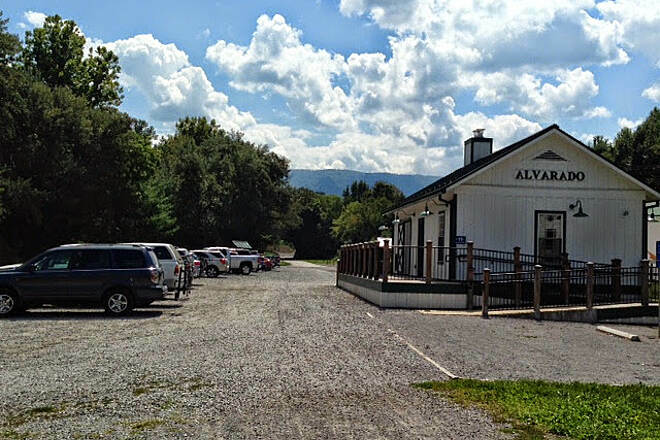 The trail is open from Alvarado east to the NC line. 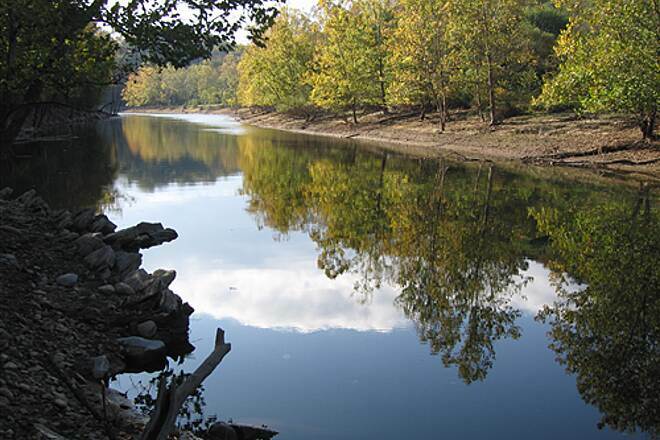 Mostly wooded with periodic river views. Trailhead in Whitetop is well marked and easy to find. There were several outhouses along the trail. Do not even attempt this trail on a road bike; it was manageable on a mountain bike. 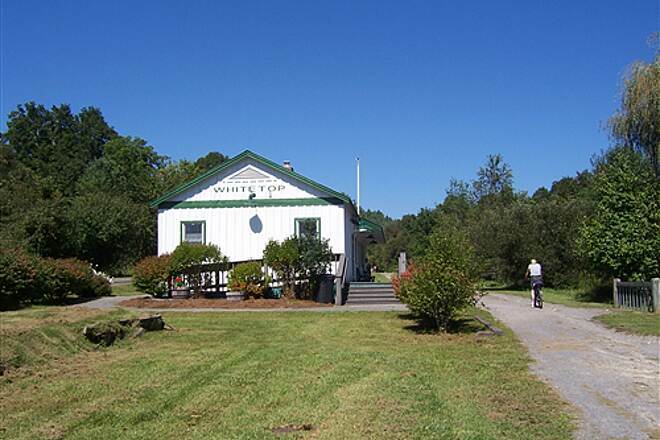 If you want an easier ride, arrange a shuttle to drop you off at Whitetop. Several outfitters in Damascus are available. If you're doing a round trip, start in Damascus so you get the uphill part out of the way first. 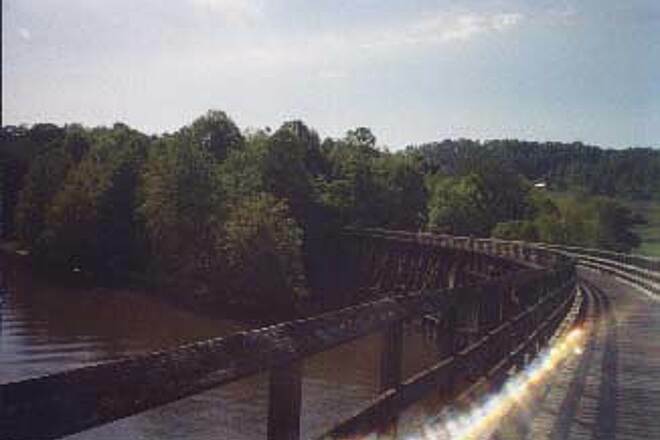 Severe storms at the end of April 2011 damaged or destroyed some trestles. 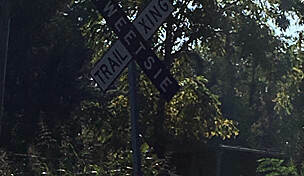 Trestle 7, east of Abingdon and one of the largest on the trail, was completely destroyed by an apparent tornado. 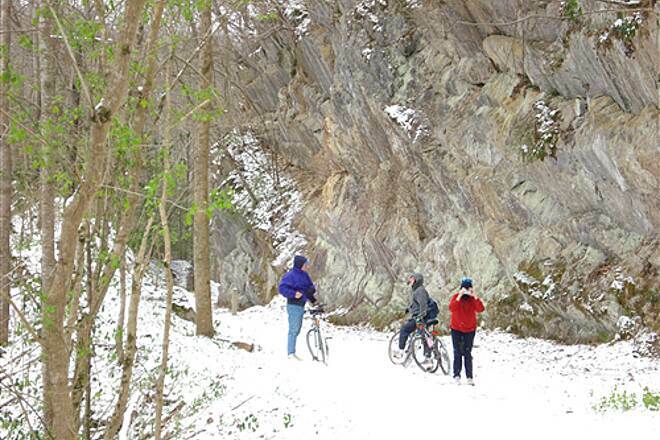 Some sections of the trail's western half (Abingdon to Damascus) are closed. I have no other information at this time. We've ridden this beautiful trail before and have plans to go back this summer. Unfortunately a tornado touched down on the trail close to the Abingdon end recently and totally demolished the LONG, beautiful trestle bridge and damaged another one. 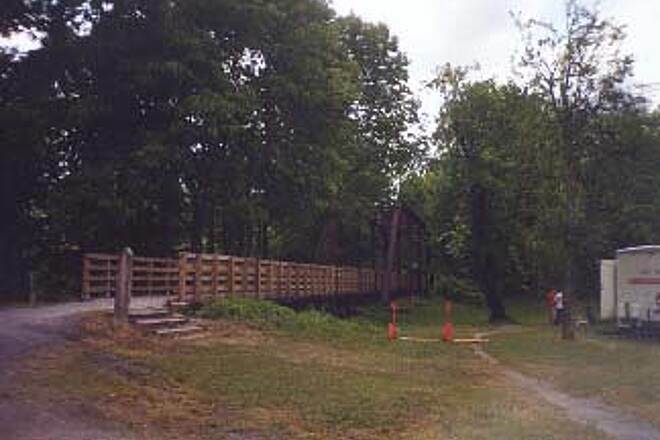 Currently (May, 2011) the first 10 miles of this trail are closed to riders until repairs can be done. It's going to take a long while. I suggest calling one of the bike shops in Damascus to get updates. In the meantime, start in Damascus and cover the other 24 miles, then come back to ride the whole 34 miles when the bridge is repaired. You'll be glad you did. It's gorgeous..........all 34 miles! 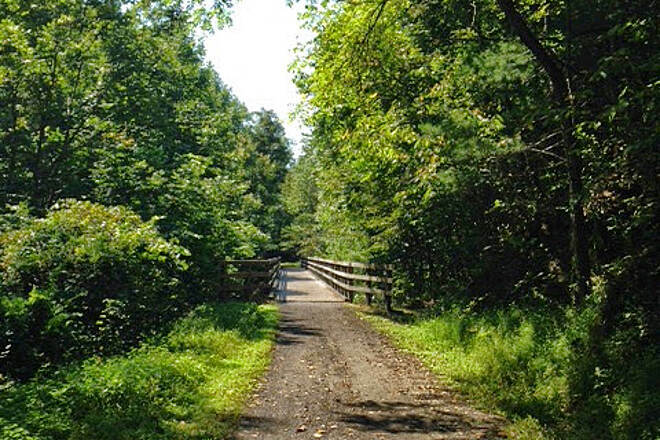 We love rails-to-trails and have done many in our local area of NJ/PA. 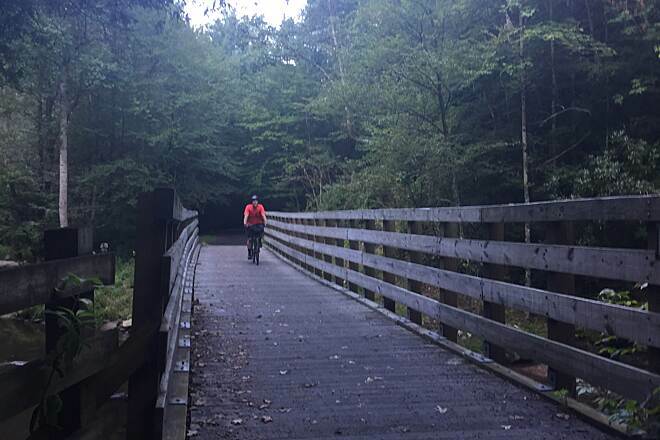 This September my husband and I made the 34 mile Virginia Creeper Trail our vacation destination, and, wow, I was so glad we did. We parked our cars at the trail head in Abington (the low end) and had the nearby bike shop shuttle us and our own bikes to the top of the trail at White Top (the high end). It was approximately an hour shuttle ride, and the drive to the top was on beautiful twisty mountain roads. About the first quarter of the trail is down hill (you barely peddle but you'll wear out your brakes), through lovely mountain scenery and along a tumbling river. The next quarter of the trail starts to level out a bit as you peddle towards the small town of Damascas, which is the half-way point, crossing the AT along the way. Damascas is a great place to take a lunch break (we bought huge icre cream cones) and see some civilization. Many riders stop in Damascas, call it a day, and will have had a terrific ride. If you have the time and strong legs, plan to continue on. The second half of the trail is different from the first. The second half is mostly through privately owned farmland with the river now slow and rather still continuing to follow beside you. You probably will peddle past some cows enjoying the river. It is also mostly a gentle uphill grade, and you'll feel it. Then just about when you think you have had enough, the last little bit is downhill, and you zoom back into Abington on a strong finish ending where the day began at the parking lot at the trail head. If you brought your own bikes, there is no need to return to the bike shop. You would think the ride would only take a couple of hours at the most, but plan on stopping, and stopping, and stopping some more to take pictures and enjoy the surroundings. I do not have the words to describe how beautiful this trail is. Be sure to set aside the entire day to enjoy it. My wife, my son, my five year-old daughter, her little brother (in the trailer) and I did the downhill run into Damascus. 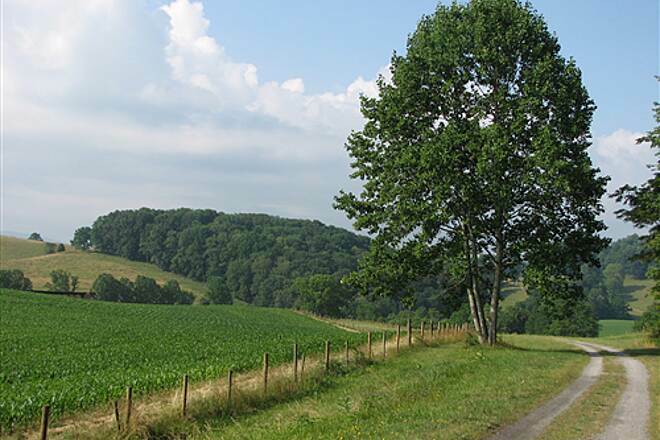 It was a beautiful trail, through rocky terrain along streams and occasionally through farm fields. There were plenty of opportunities to stop and let the kids throw rocks in streams, or take water, snack or potty breaks. 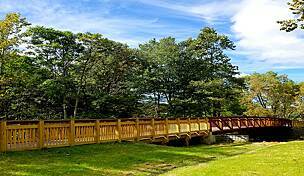 There were a phenomenal number of trestles, from short things to a striking long high wooden bridge to an iron trestle right before Damascus. 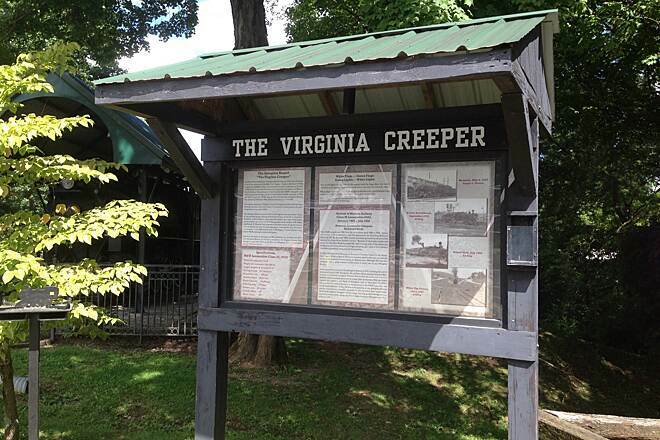 We stopped for only a few of the many geocaches along the trail, and the places where the Appalachian Trail joined with the Virginia Creeper Trail captured my wife's imagination. Unfortunately, the top of the trail was closed, and so we could only start at Green Cove. We had tried to get information in advance of closures or trail work, but we could only get information from the shuttle company. There was work on some of the trestles, when a number of riders would pile up, but the workers allowed us across when they could. We didn't see the crazy bikers bombing down the hill that other folks mentioned, but we were travelling during the week. Hopefully, our delays will pay off for years to come. Damascus was a wonderful town, although I don't understand their affinity for cute B&Bs that are not family-friendly. There was a playground for the kids on the west side of town. Hopefully, the next time we make it out to Virginia, we'll be able to do more, both at the top of the hill and west of Damascus. I'm totally convinced you find what you're looking for. Think about it. The Creeper is a wonderful trail which winds through both mountains and scenic farmland; definitely not the place for pavement! 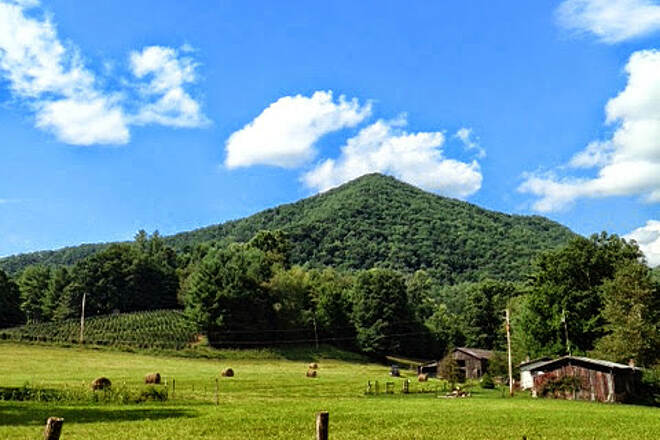 We have ridden the upper section (Whitetop to Damascus) many times.....admittedly we took the shuttle up to Whitetop Station and 'coasted' down. But it was enjoyable, exhilarating, and downright beautiful! 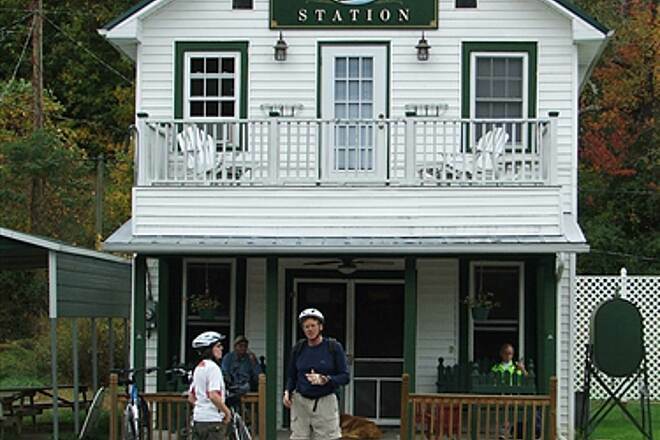 In Nov 2009 we parked in Abingdon, rode our bikes to Damascus, caught the shuttle up to Whitetop Station and rode all the way back to Abingdon. The trip was approximately 51 miles and although it was pretty cool (the temperature, that is) , we loved it! It was a really good experience......and would definitely NOT have "been the same" had the trail been paved! We ride Trek hybrids and have had no problems whatsoever. Oh, and did I say we drive over 100 miles to do this, and that we're "seniors?" The trail looks flat, but it has several different grades. From Abingdon to Alvarado (7mi) is gradually downhill. From Alvarado to Damascus (7mi) is gradually uphill. From Damascus to Whitetop (15mi) is a strong uphill. Most people park in Damascus and take a shuttle to the top, and then coast most of the 15 mi back to Damascus. A great family outing. 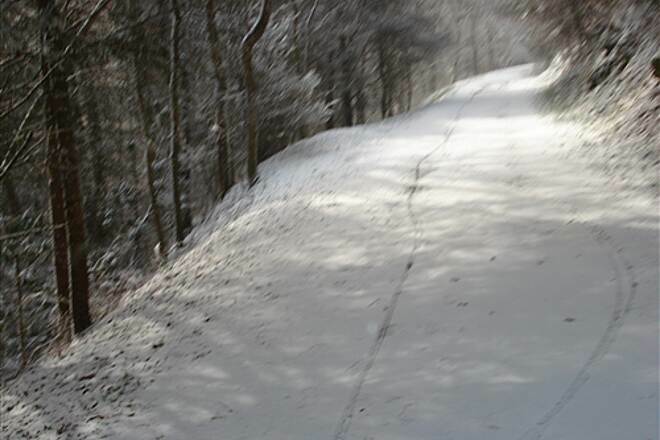 Going uphill from Damascus to Whitetop is a real thigh burner only for the athletic. But don't overlook the other half of the trail. Park in Alvarado (follow signs to the winery off US58, then about 1/2 mi past) and take the gradual ride uphill 7mi to either Abingdon or Damascus. Then when you turn around, it is an easier ride back to the car. In 2010 and 2011, they will be working on some of the bridges. Call a local Chamber or one of the bike shops in Damascus to find out if there are any detours before you head out. Path is not paved, but the small gravel is very easy for a hybrid bike. On July 9 we rode the portion from MM20 to Damascus & back. 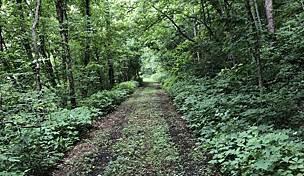 It was very diasappointing in that it, in no way, compares to the many nicely maintained trails, which are asphalt or concrete surface, that we have ridden in other parts of the country. Most of the people who rent shuttle bikes & roar down from Whitetop are a hazard to those of us who are recreational bicyclists. The portion from Abingdon was a more enjoyable ride. We don't plan to return to this trail. We biked this trail for the first time in May of this year. We ride Trek Hybrid bicycles. There were a few rough spots at the beginning, but no problem. Beautiful trail and we loved it. Rode the entire trail and would do it again. 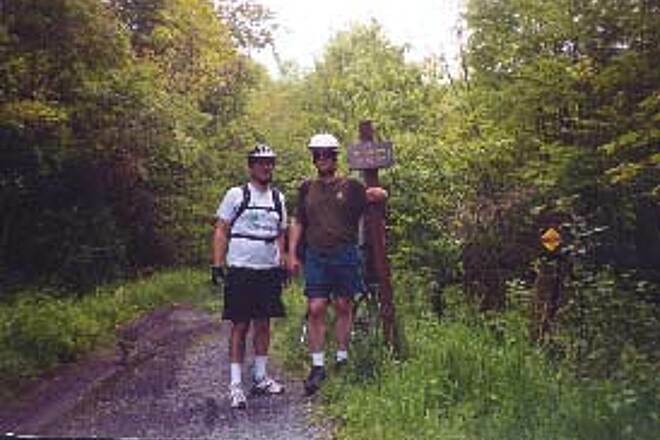 We are from Arkansas and were there hiking and biking. 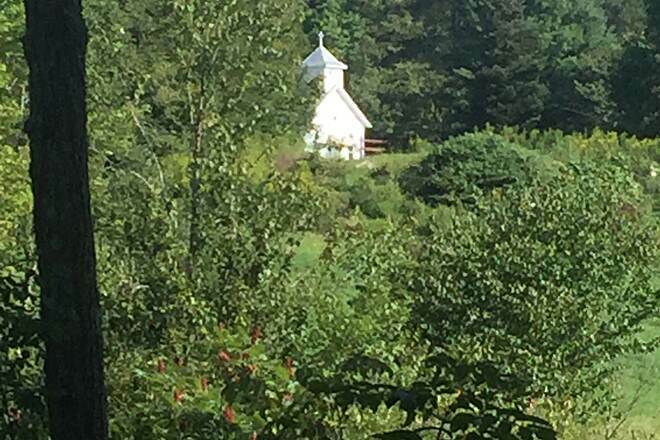 I failed to mention the ride between Abingdon and Damascus -- it is just as wonderful. 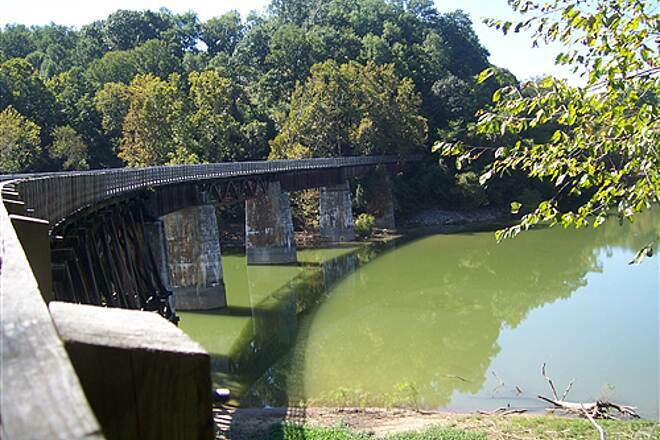 Just around 7 miles from Abingdon is a long bridge -- it is picture perfect view of two rivers coming together. I highly recommend this ride of the trail. On this part of the trip there are fewer places to stop for food and drink so be prepared with plenty of water and snacks to keep up energy. Remember to be considerate of others riding the trail by staying on the left when riders are coming around you or you see riders coming toward you. Please remember to put your trash in a trash can and not on the ground along the trail. This is a wonderful rails to trails. In Demascus there are plenty of B&B places to stay, but if you care to have a bit more rustic experience, you can stay at the Iron Horse. Iron Horse has individual connected cabins with just a bed and place to hang some clothes. The clean showers are in a different building just a short walk or 1 second bike ride. 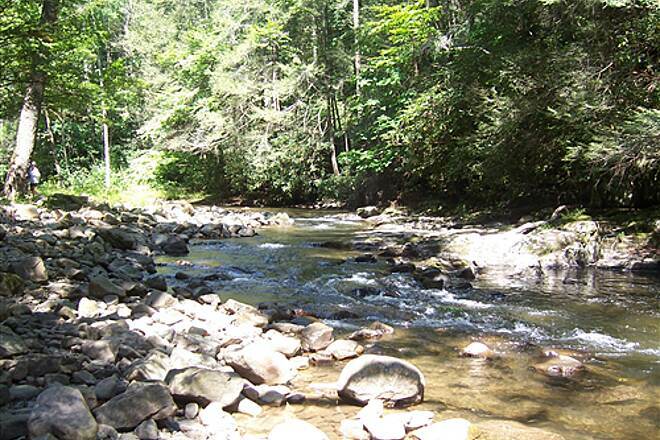 It is really nice sitting on the deck enjoying the peaceful setting with a nice creek running close by. We really enjoyed staying at the Iron Horse. Now, to the bike trail. 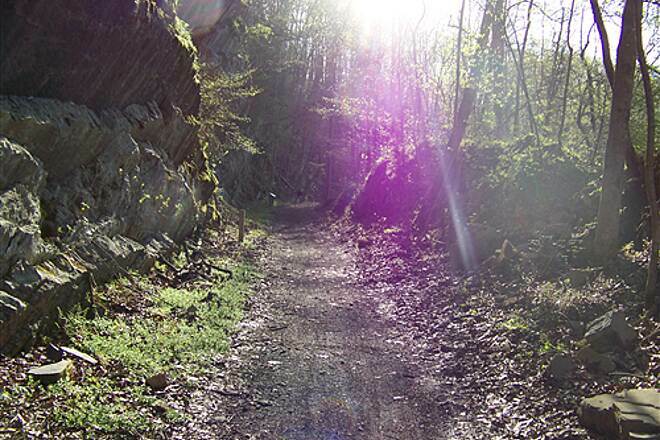 It is a wonderful trail. If you happen get a ride up to White Top and don't feel ready to head down the hill, try going the other way for a few miles. That part of the trail isn't kept up as nicely but it is a easy ride all the same. There are lots of places going down the hill to catch your breath to get a bite to eat, an ice cream cone, almost anything really, or just enjoy the view. Just remember one thing - watch yourself when crossing roads, stay to the left when people are riding by you, give people a nice heads up to let them know you're passing, and last but not least -- please do not litter. "This trail is great exercise going uphill. I suggest that the shuttle companies educate their customers a little better on trail etiquette. Those going uphill shouldn't have to be blocked constantly by coasters on the left (wrong) side of the trail. This situation not only impedes the momentun of those who actually seek exercise from this trail, it also creates a dangerous situation for the coasters who would have to stop quickly in case of a crash. We made a round trip between Alvarado and Damascus. Parts of it were quite rough and could be considered off-road. There were sections that were just single track and very narrow at that. 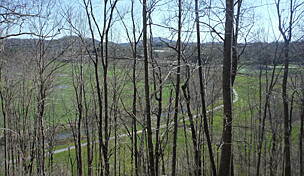 It is obvious that the best part of the trail is between Damascus and Whitetop. 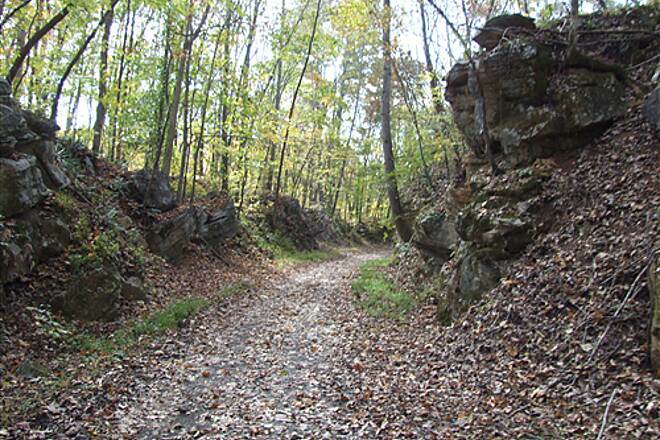 "This piece of the trail is by far the flatter of the two pieces. It's a totally different ride than the one from Damascus to Whitetop. It's a nice easy ride with some good ""refreshment"" stops along the way. We actually went down a piece of the river by the trail the day before on tubes that we rented from the Ironhorse Campground. They do the shuttle for you. As with the the rest of the businesses we visited, they were the most accomodating people imaginable. My only dissapointment was at the Abingdon end. It very hard to know where to go once you reach the end of the trail. They need a few signed to direct us tired bikers to food and water. Other than that, it was another nice piece of the Creeper Trail. Again, don't miss the local flavor in Damascus. 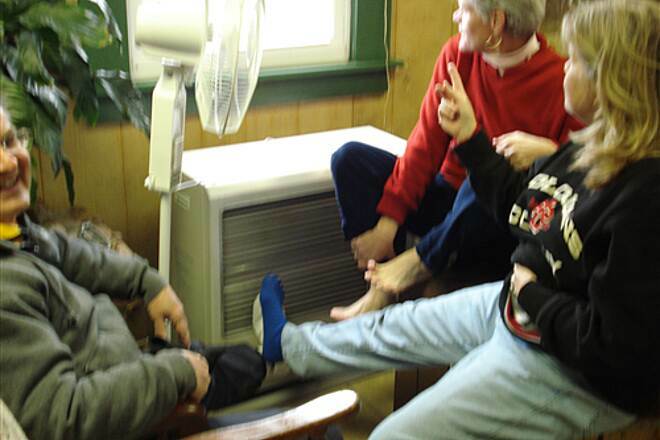 The people are the dictionary definition of southern hospitality. " "If you are a regular bike rider, don't miss the enjoyment and satisfaction of making the uphill ride as well as the downhill. It's not that tough and even if you have to stop a few times, the pride of having earned the downhill is a great feeling. My wife on her bike and our six year old on a trail-a-bike behind me had an awesome day of riding. The trail is beautiful and if you miss the opportunity to take a dip in the stream, you've missed a piece of the experience. Do watch for the going-a-little-to-fast downhill crowd as I agree that there are a few riders who missed their drivers test. All in all it was a great ride. Don't miss the ""local"" music as the townpeople call it, the good eats at several places, and the great attitude of the people who live in the ""friendliest town on the trail"". " 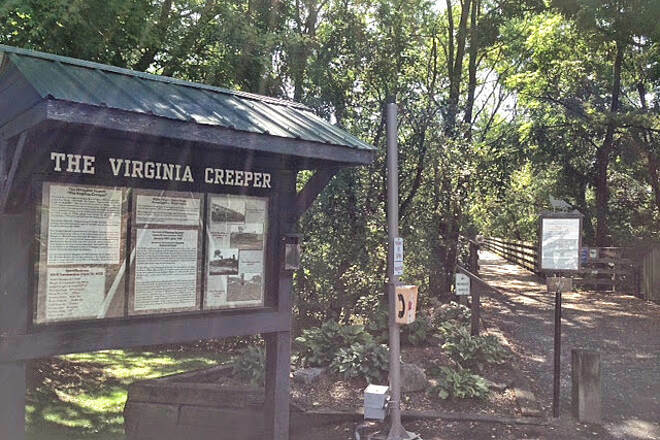 The Va Creeper Trail is SO popular with the 17 miles of downhill that I would not recommend Saturday for the serious rider. All of the other 6 days of the week are recommended. We were also impressed with the people we met in the area. At every stop that week the townspeople were justifiably proud of ""their"" trails and made us feel welcome. Obligatory word about the shuttle downhillers: Beware. Most of these people are novices, not bike tourers who put thousands of miles a year on their tires. A few could barely ride, much less comprehend the rules and courtesy of trail riding or touring. We knew to expect this, compensated accordingly, and did not let it detract from our enjoyment of the climb or descent. But it was still a bit unsettling having semi-controlled tonnage freights roaring downgrade at us, or trying to pass people who couldn't track a straight line on a smooth trail. 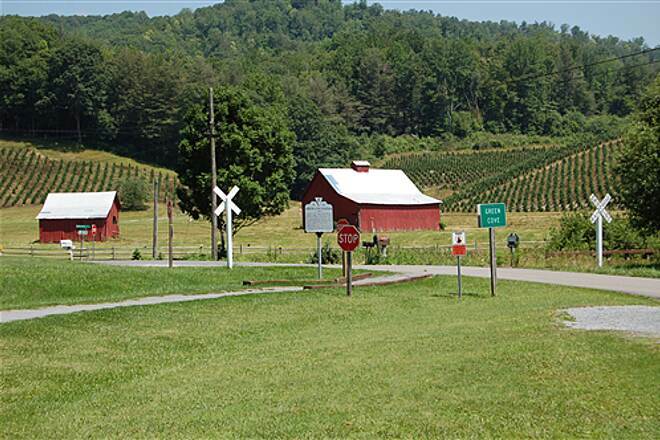 The Virginia Creeper is truly a national treasure and any cyclist would do him or herself a huge favor by riding it. I'll certainly be going back in the future. Barry (from GA), with Mike (Ala.) & Joe (Ind.)" Beautiful Trail - Must see! 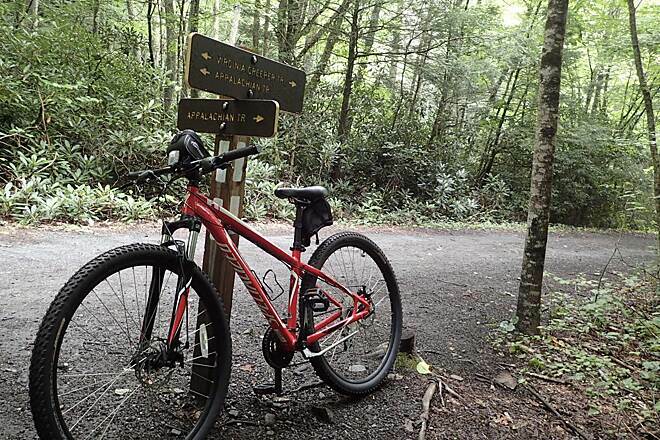 "I rode the top half of this trail via shuttle to WhiteTop Mnt. and then 17 miles DOWNHILL last fall. It was cold, misty rain but what a ride! I had the trail almost to myself because of the rain. Just got off the the trail this weekend. Left Abingdon intending to ride to Damascus and back (the flatter lower end of the trail) but by the time I got to Damascus, I could not resist the challenge of seeing how far UP the mountain I could go. Made it 10 more miles up the mountain. This trail is incredible. 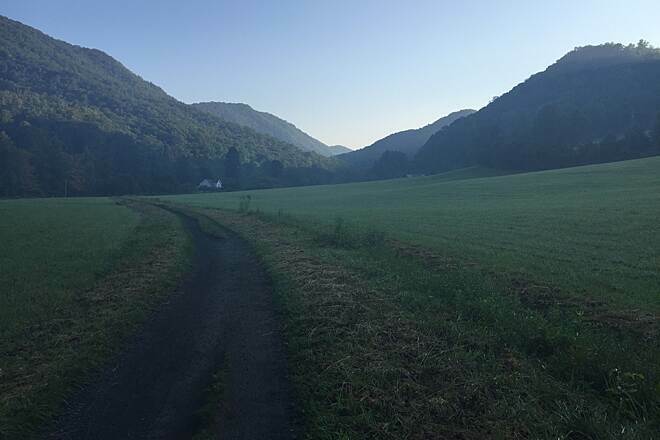 Ranges from lush pastures with cows on the trail to steep mountain terrain in the middle of a forest. Saw three deer standing in the middle of the trail in no particular hurry to move and then on a rest stop under a rock bluff on the return trip between Damascus and Abingdon, I heard a rustling above my head followed by a swish of falling leaves as a wild turkey flew off of the cliff above my head and down into the river valley a hundred feet below! I will do this trail again." This was a great ride (except for the crowded trail with lots of children and people standing in the middle of the trail) this was the most enjoyable ride ever. My husband and I did the whole 34 miles. Many places to stop to grab a snacks or lunch!! Definitely plan to do again! When can I go Again??? "We loved it! Lots of great people we met on the trail! We will definately be returning asap! What a fun and beautiful ride! We have not stopped talking about it since we returned last week, and are conviencing some friends to go next weekend!" "What a GREAT experience! 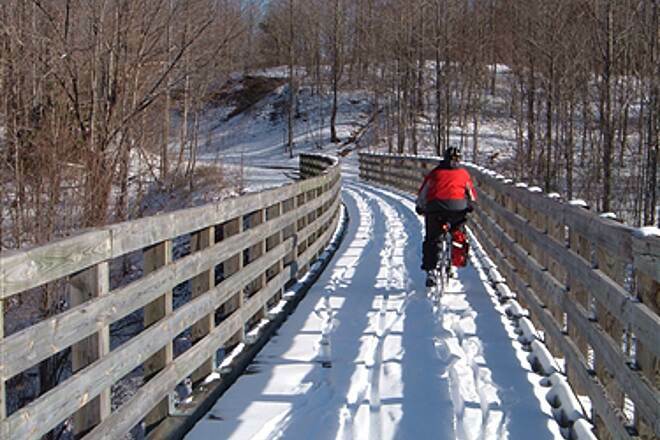 If you ride only one rail-trail in your life, make it this one!" Well we two old folks have now rode it all! Both ways! It is great. The uphill to White top was the best! "Took our 5 grandkids, 8 to 3 on the trail. Finished it all in day and half, we cheated kind of, went from White Top to Taylors Valley (downhill) then had lunch, then to Alvarado (mostly downhill) on the first day. Then started at Abingdon and went to Alvarado the second morning (mostly downhill). 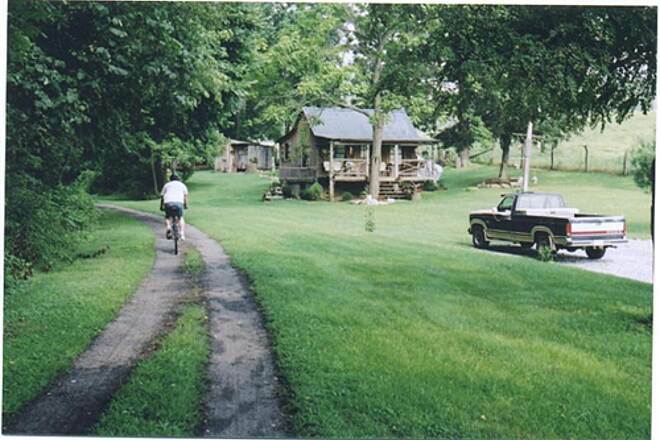 Great stay at Creeper Trail Cabins in Taylors Valley." 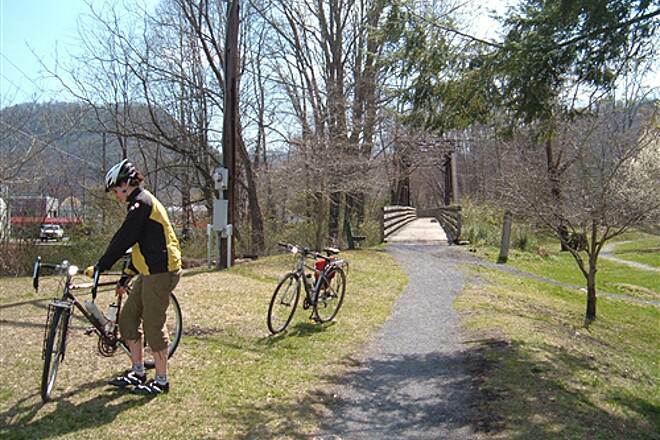 "Reviews had declared the Virginia Creeper Trail one of the best trails in Virginia. Well, they were true, and then some. We detoured from Virginia Beach on our way back to Montreal, Canada (yep! a bit of a detour). We stayed in Abingdon at the Summerfield Inn (Janice and Jim are among the best hosts we have ever met and the Inn is top-class). We decided to take the shuttle to White Top Station and ride all the way back to Abingdon. The White Top Station to Damascus section of the trail is absolutely breathtaking. The trail meanders through the country side right along the river for a good part of the way, crossing from one side to the other. There a a good number of very impressive bridge crossings. The Damascus to Abingdon section is a complete change of scenery. Although not as impressive as the first section, it has its definite charm. The Damascus/Abingdon section is in poor shape in spots, shrivelling down to barely a single track on some of the private properties. 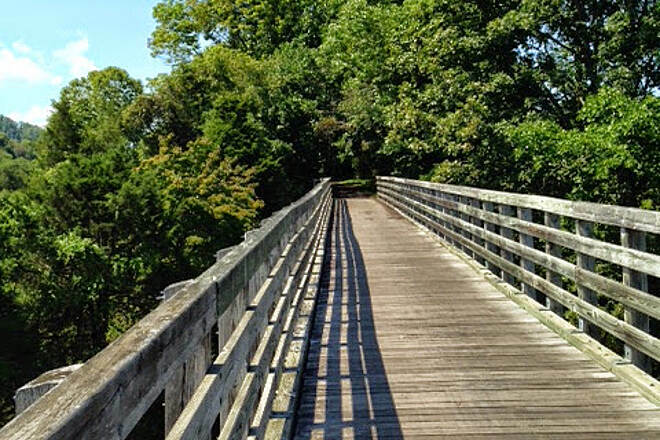 Also, be aware that some of the bridges are getting a new deck surface and rails on this section of the trail and you are advised by work crews that you cross the bridge at your own risk. A recommendation for occasional bikers. Do not let the White Top Station to Damascus section of the trail lure into believing that this is an easy beginner`s ride. The Damascus to Abingdon section goes uphill (although ever so slightly) most of the way, which can become tiresome for the unexperienced. All in all, this was one of our most memorable trail rides this year." 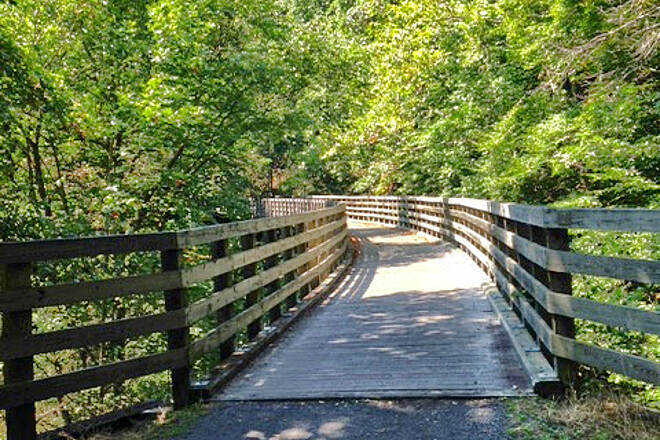 "The Boy Scouts Troop 5 from Clarkesville, Georgia, loved this trail. 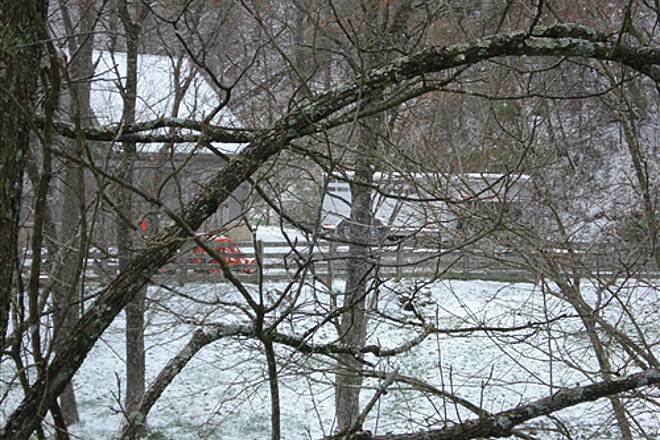 We started at Whitetop Station in the snow this early April day and ended in Alvarado. The scenic spots and trestles along the trail really kept the interest up. The Damascus to Alvarado segment had much beauty along the river. There are many shear rock cliffs in that section. " 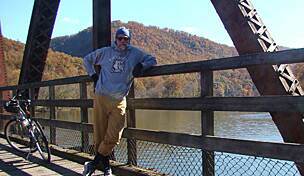 "We adventured out from Michigan to this natural beautiful excursion in October of 2003. It was a wonderfull week spent outdoors with my wife. 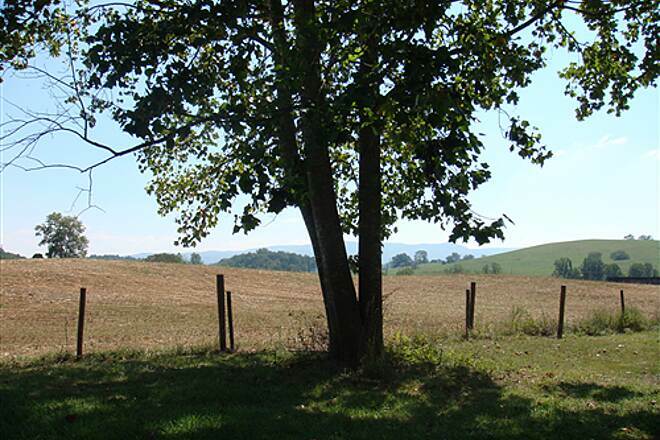 There were many scenic spots and it was a very relaxing ride from Whitetop to Damascus. 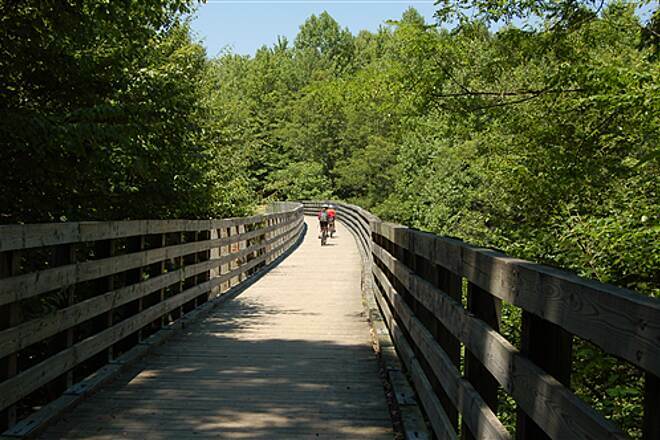 Separate yourself from the rental riders and ride the second half of the trail from Damacus to Abington. This portion of the trail is less traveled. It only has one store and rest stop along the way. 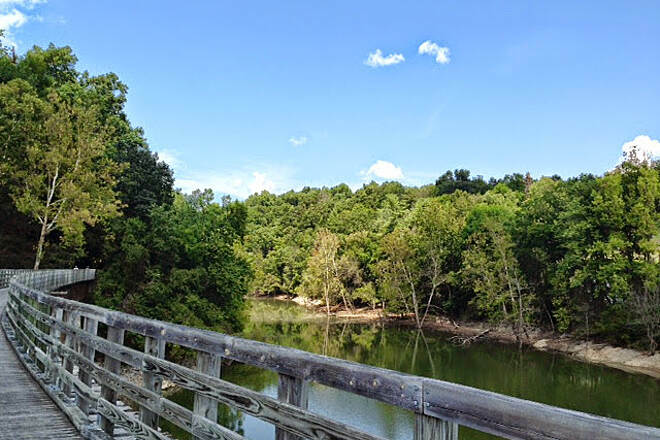 There are some fantastic views as you follow the rocky rolling river and pass over the old, wooden railroad bridges. My wife is physically challenged with fibromialga, yet she managed the journey just fine. It was an excellent adventure to reconnect with nature to and get away from all the hustle and bustle of modern day life. 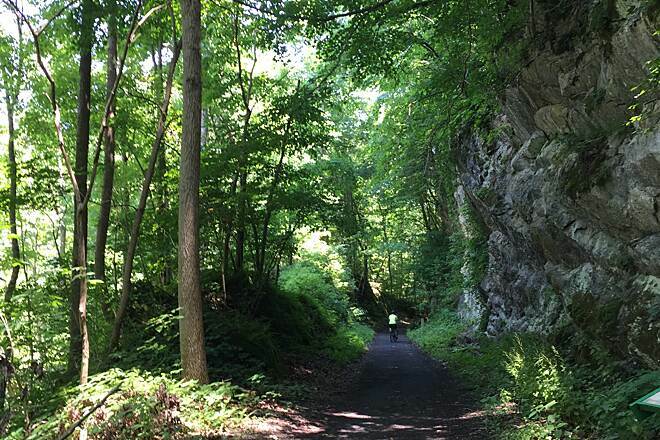 It's really peaceful and quiet when you ride the trail on a weekday." 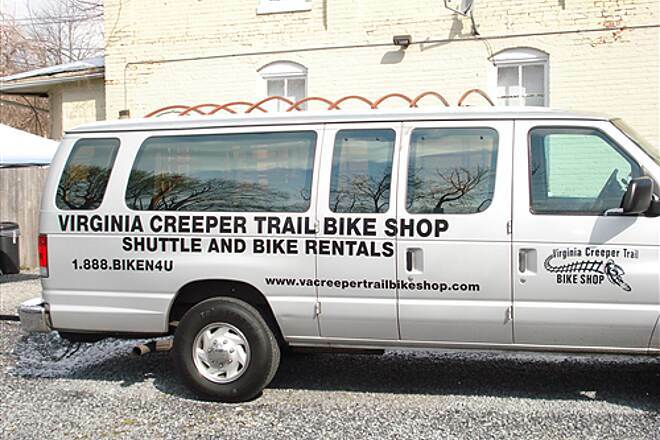 "My wife and I recently rode the Creeper starting from Damascus and going toward Abingdon. It's a very scenic ride with a very slight uphill into Abingdon. The scenery is fantastic and filled with delightful views. There were a few gates that we did have to stop for but that just added to the experience. The only drawback was no water along the trail. The second day we rode from Damascus UP to Whitetop Station. I must emphasize up. It is a steady uphill climb for the best part of 17 miles with the steepest from Green Cove to Whitetop. 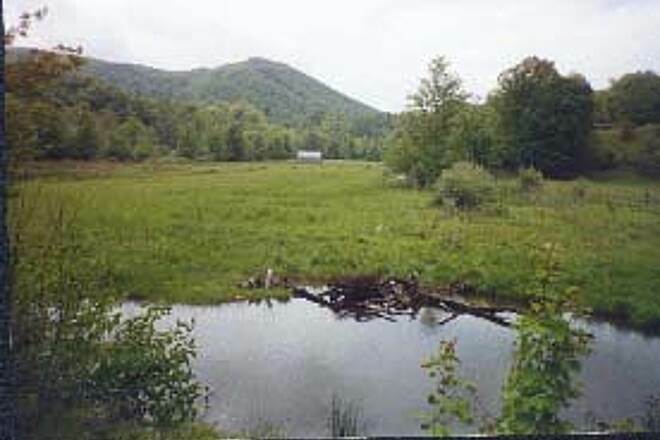 The scenery is of lush forest land and creeks. There is an especially pretty waterfall about halfway up that was a refreshing stop. 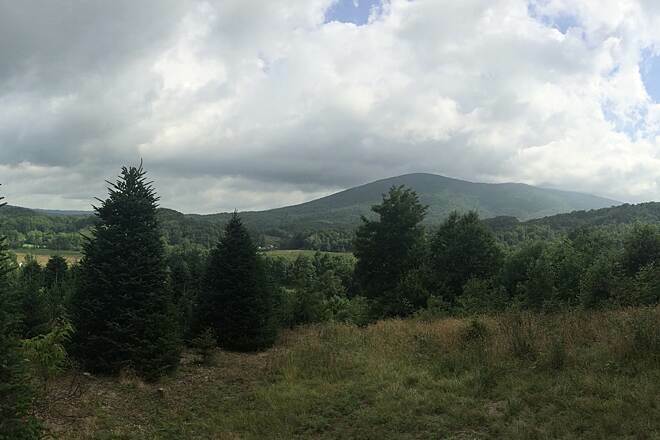 At about 2 miles from Whitetop there is a trail that cuts off to the right and leads out to a fantastic view of the surronding area, a great spot for a snack stop on the way up or for lunch on the way back down. We brought our own food that we purchased at a Subway in Damascus; we were told that there was no place to purchase lunch on the trail. Be especially careful going up the last three miles or so from Green Cove. The trail becomes narrow in some places and it seems that most people take a shuttle up to the top and ride back down. My wife was run into by a younger rider going quite a bit out of control coming down the trail. Thankfully no one was hurt but, for some reason her parents saw nothing wrong with riding 2-3 abreast. This was a common sight for us. We could always tell when a shuttle had just left. 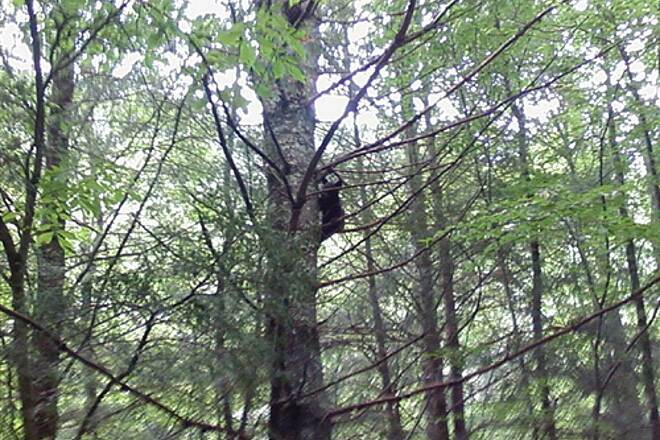 Please make sure to stay to the right of the trail and keep a sharp lookout. It was about a 4 hour round trip and all in all a delightful ride. " "We rode the creeper on Friday and had most of the trail to ourselves. I don't know if that was because of the threat of rain or because it was a weekday. We called upon the fine folks of Adventure Damascus for a shuttle ride to Whitetop. 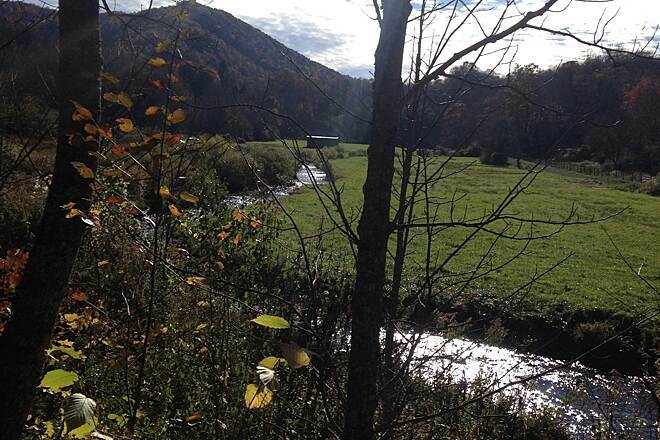 Whitetop to Damascus was very enjoyable and required many stops just to admire the scenery. With very little work we reached Damascus where we stopped for lunch. 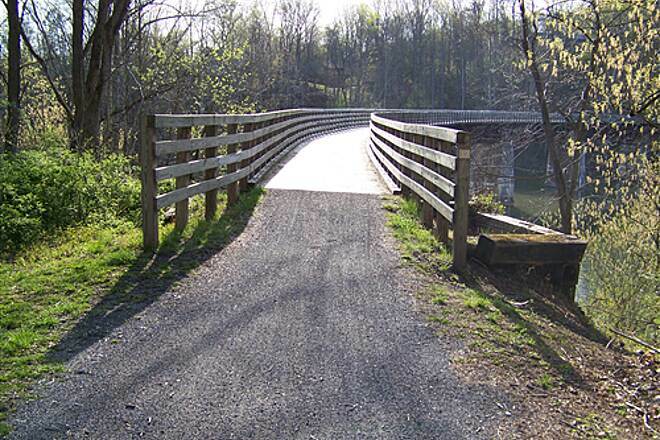 My wife drove back to our hotel in Abingdon while I rode the Damascus to Abingdon portion of the trail. This section was also scenic and relatively flat with a slight uphill toward the end. All in all, it was a very enjoyable ride." 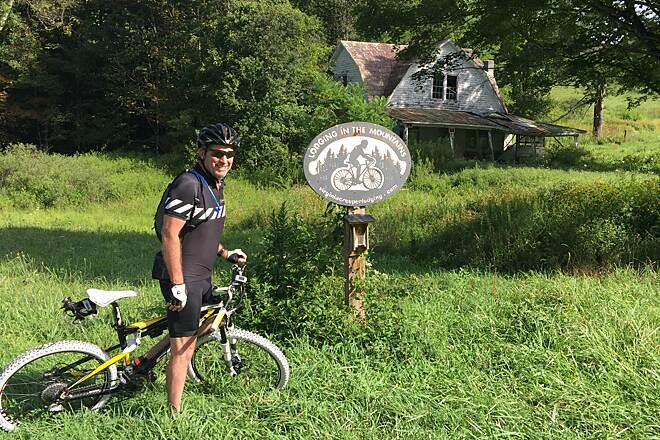 "I recently rode from Whitetop Station to Damascus and enjoyed every minute. 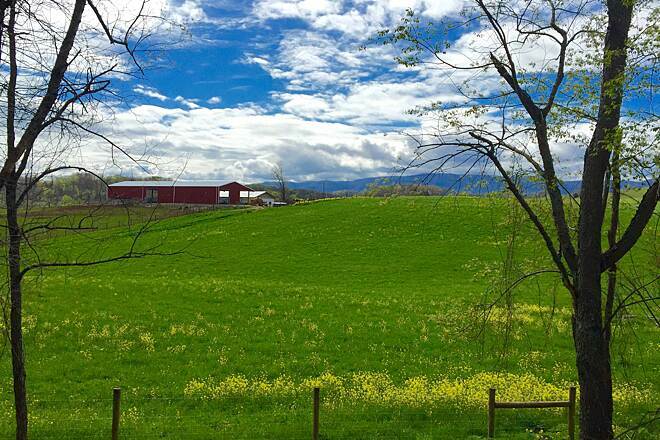 The drive along route #58 from Galax is also a visual treat -- it's a constant series of visual and sound delights. Make sure to take the time to look and listen. 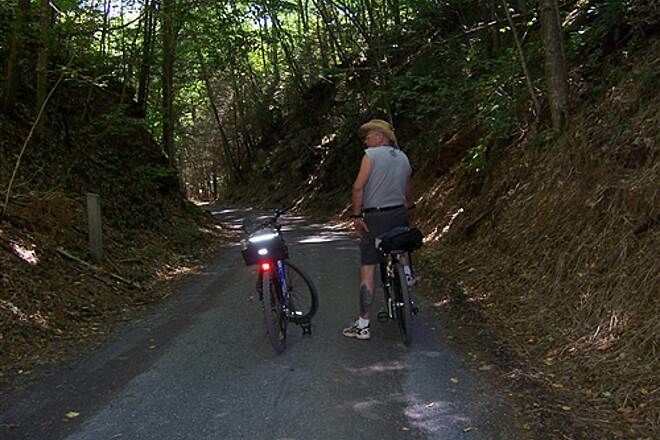 As a result of the downlhill slope, very little energy will be required to peddle so take some food and enjoy! I'll return soon to finish the ride from Damascus to Abingdon. One minor complaint is that some sharp embedded rocks caused a pinch flat about 5 km downhill. I recommend carrying an extra tube. 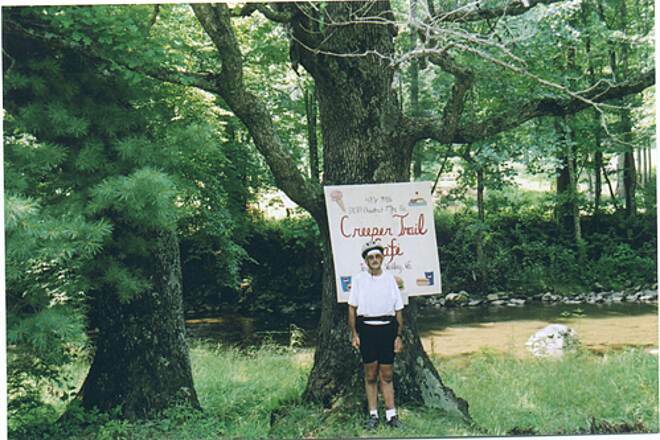 "My wife Deborah and I rode from Abingdon to Damascus on July 20. The scenery was absolutely gorgeous, and the ride was quite easy. 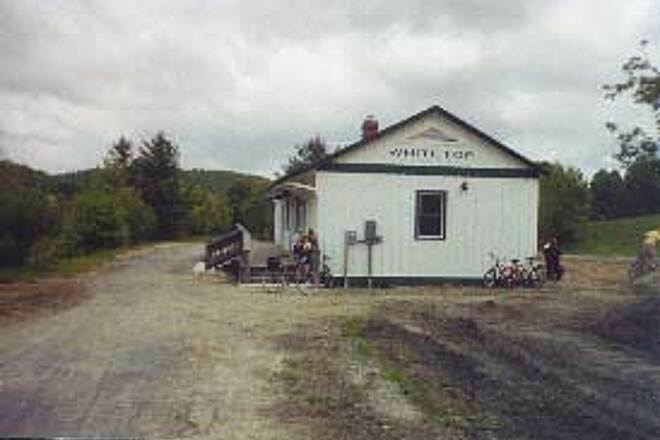 On the 21st we rode from Damascus to White Top Station. I didn't have a problem with this uphill ride but it was the first time I've had to ride in gears two and three for any extended period of time. I believe my wife would disagree with John Rocap (see ""Our trip on the Creeper"" review) about the difficulty of this part of the ride as she walked and pushed her bike off and on for about thre miles of the 17 mile climb. The trip back from White Top Station to Damascus was a BLAST! It took us about one hour and would have been quicker had we been brave enough to hold off using our brakes. But then life is more important than foolhearted bravery. I would encourage folks who ride the Creeper to take their cameras. We did and will do so next time too." 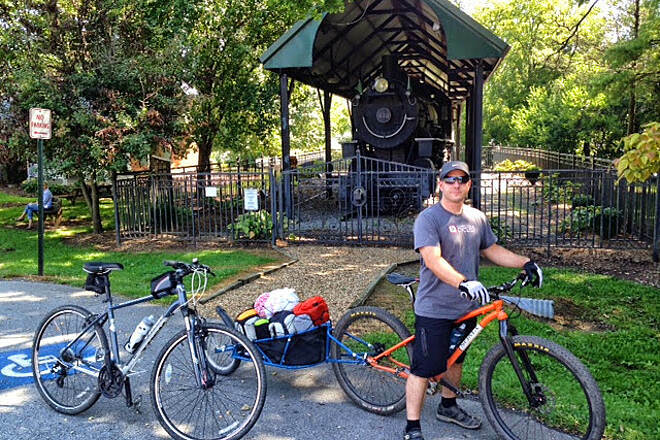 "My husband and I went on our first ""Rails to Trails"" ride by accident. 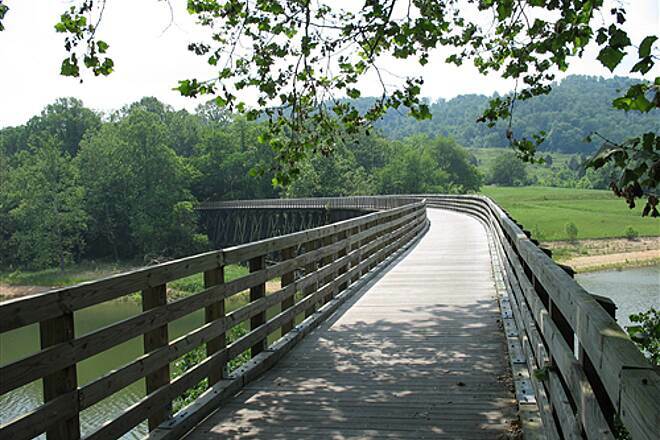 We took our bike to Abingdon not realizing the Virginia Creeper trail was right there. We hooked up with a shuttle service called Blue Blaze. We rode from Damascus to Abingdon, about 17 miles. We loved it! We heard the real thrill is from White Cap Mountain to Abingdon, but we were novices and had a great time. The scenery, once you got past the city of Damascus, was gorgeous. 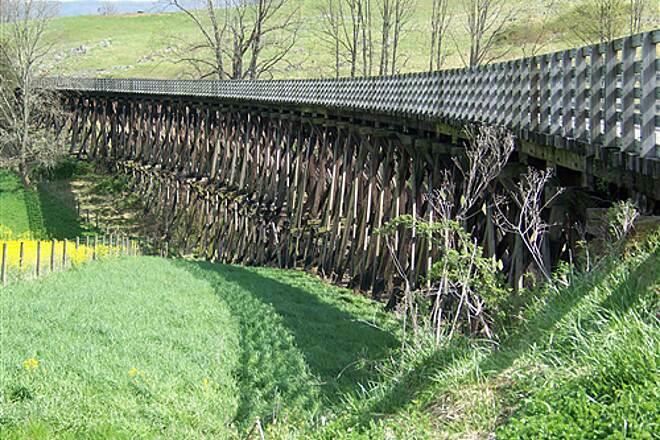 It was a thrill to ride on the trestles and by pastures and cows and over rivers. 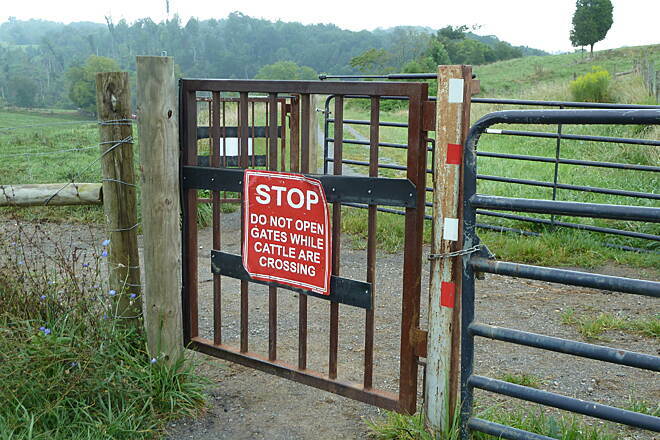 We didin't even mind the opening and closing of gates that ran through farms. We are ready to try another trail! There was a nice little store about halfway between Damascus and Abingdon (Alvardo? or something like that) that sold bottled water and other things. The trails were mostly tree-lined. A few rocky areas that jarred your head a bit, but we had a ball. " "My wife and I recently (Oct. `01) did the Creeper. We stayed in Damascus at a Bed & Breafast and did the trail on Saturday and Sunday. On the first day we road from Damascus to White Top Station. The grade is gradual and steady and a good (but very manageable ) workout. The trail is beautiful. There is only one downside. There seems to be a couple of shuttle companies that rent people bikes and then carry them to the to White Top Station and disgorges them 25 at a time to ride downhill for fifteen miles. Many of these folks are inexperienced and many are children. The result is CHAOS!!! Our experiece was seriously diminhished by out-of-controll groups running headlong into us. It's an accident waiting to happen. I guess it's good that folks are getting out and enjoying the trail. But I don't see what they are accomplishing. It is being treated as if it were an amusement park ride. This is a beautiful trail and (in my opinion) this type of use is a perversion. Our second day, we rode from Damascus to Abington. This is a very easy trip(31 miles round trip). It is also a very beautiful ride. There were very few people on the trail until after noon. We went to a very nice restuarant in Abington, had a nice lunch and then rode back to Damascus at a leisurely pace. A very enjoyable trip. To avoid the amusement park aspect of the Damascus to White Top run, I'd suggest that you do it during the week. But if you haven't experienced this trail, please do so. But don't ride they ""weenie bus"" to the top and glide down effortlessly to the bottom. Also, if you have the time, spend a little of it in Abbington, Va. This is a very scenic city with a lot of great amenities. 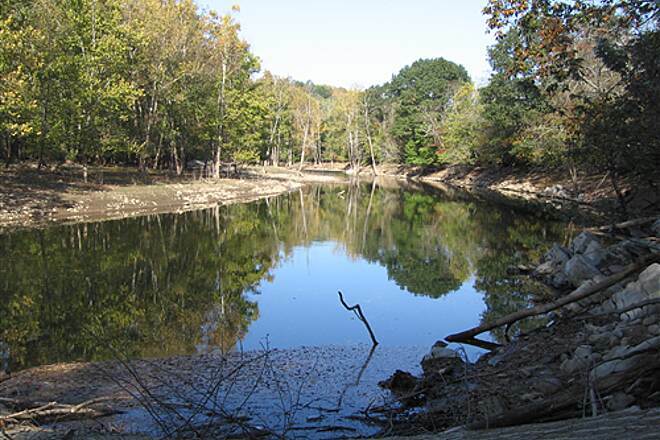 My wife and I didn't really have the time to spend, but the next time we go you can bet that we will stay in Abbington and ride to trail from there. " locomotives ""creep"" up the tracks in different parts of the trail. However, only about half the trail is that difficult and only if you're going uphill. At Abingdon, the elevation is 2065 ft and gradually drops to 1900 ft at mile 8.1. The elevation rises gradually to 2000 ft as you come into town of Damascus (more on the town later). 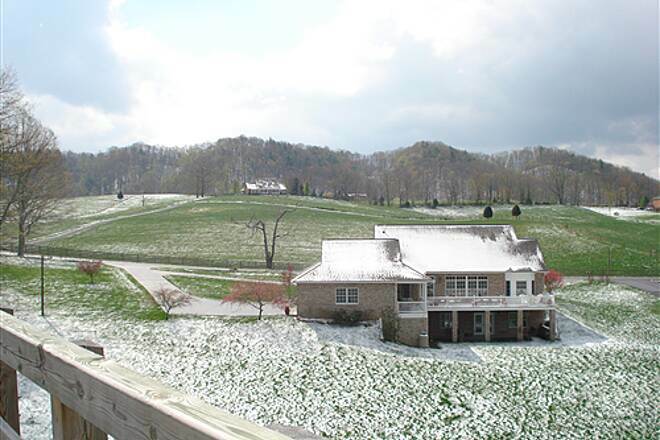 Then, the grade up to Whitetop Station (mile 33.2, 3576 ft) averages 2.2% to 2.85%. 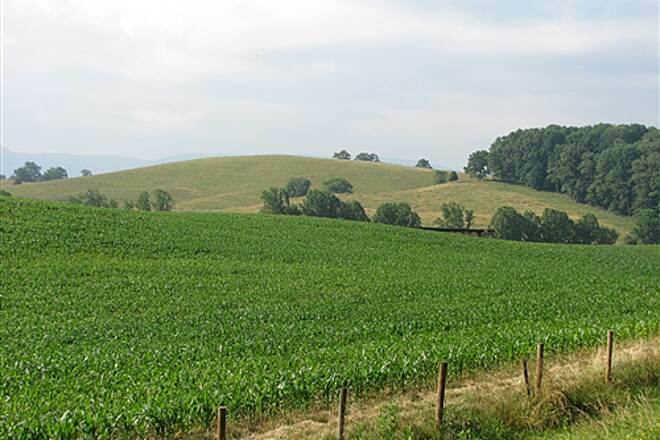 However, the actual grades can vary between 0% and 6% between Green Cove (mile 30.2) to Whitetop Station! 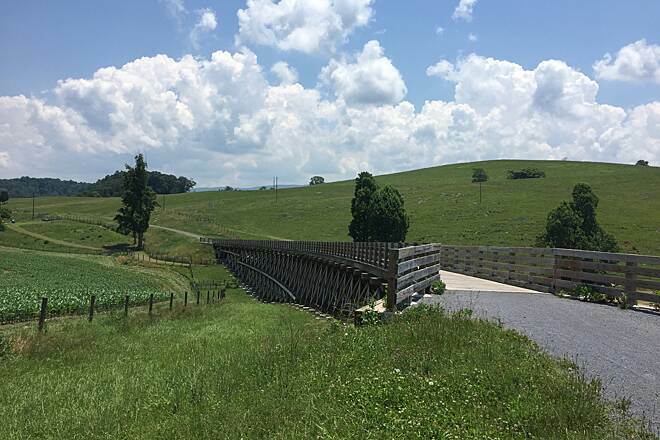 Since my riding partner and I were up for a challenge, we decided to start at Abingdon and ride past Whitetop Station to the end of the trail. Then turn around and go back downhill ending at Damascus, making a 52-mile ride. Things started out well enough. 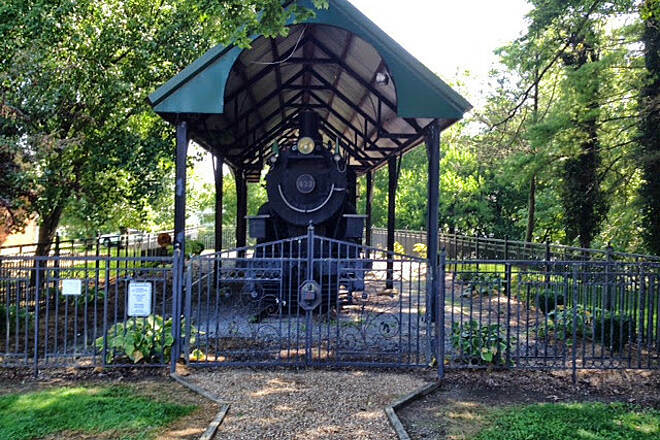 We found the trailhead in Abingdon and marveled at the old locomotive that was there. challenge levels, depending on your time. Photos will be posted here later.